TO LIVE IN VERY COLD WEATHER CONDITIONS. 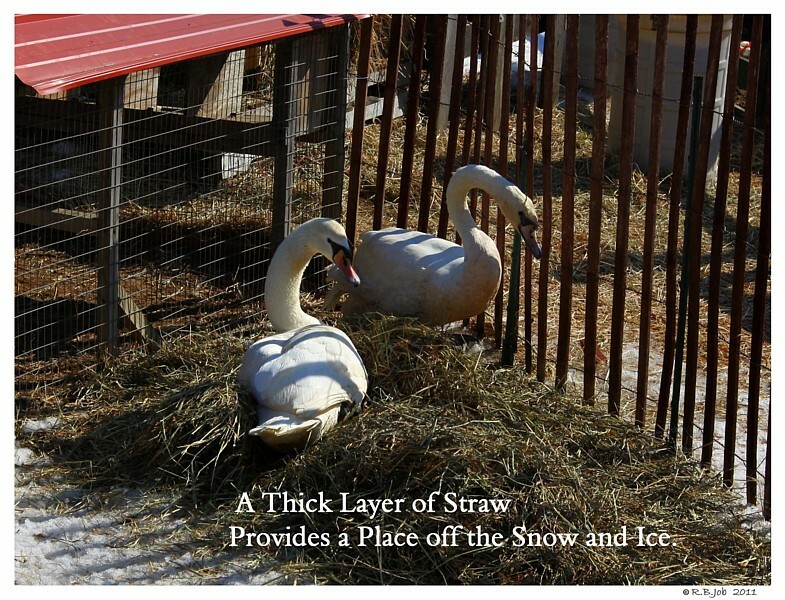 WILL HELP YOUR CAPTIVE SWANS REMAIN HEALTHY OUTSIDE FOR THE WINTER MONTHS. 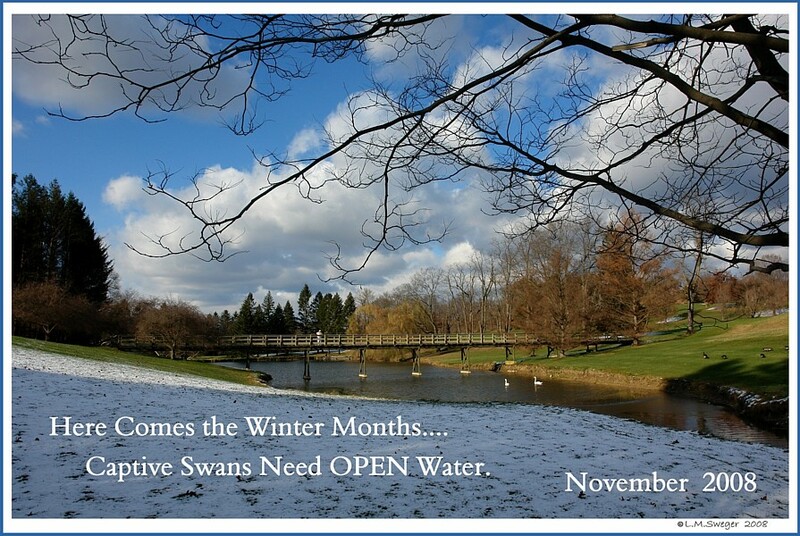 As Fall approaches each year.. it is time to check that your Swans are Healthy. 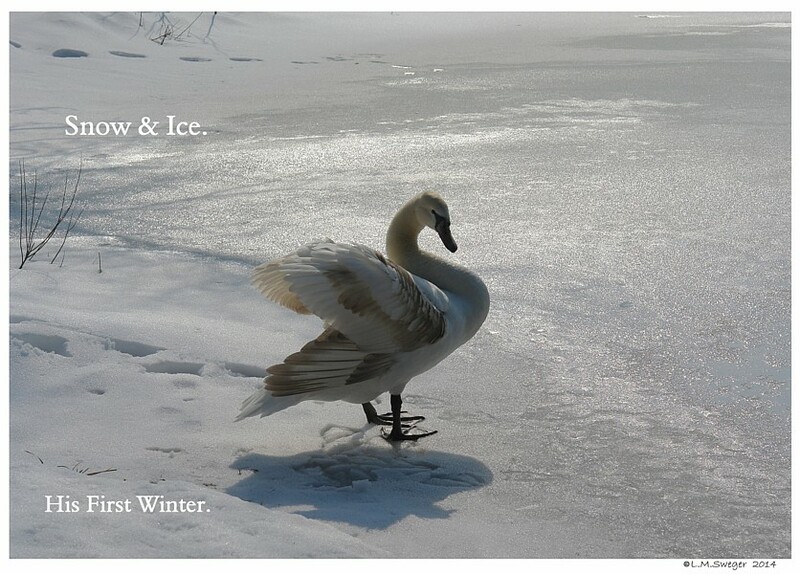 Good Body Condition is very important for Swans to tolerate Winter Conditions. 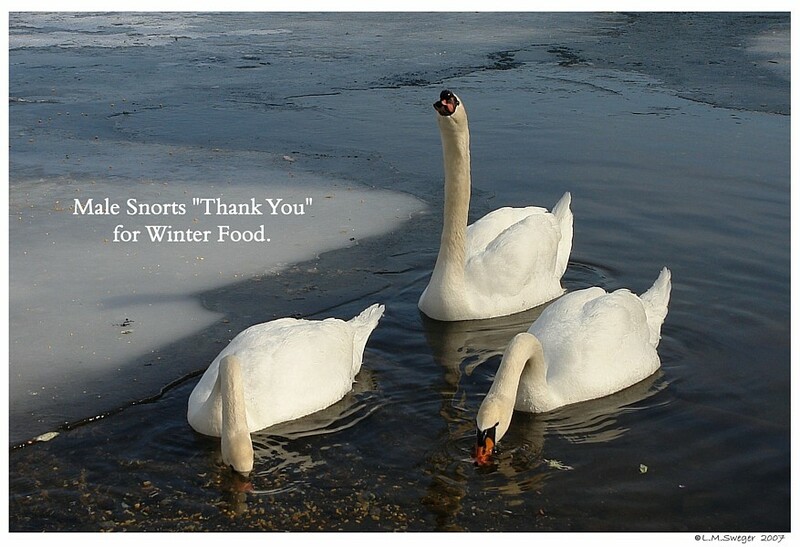 Total Nutritional Support for our Mute Swans. 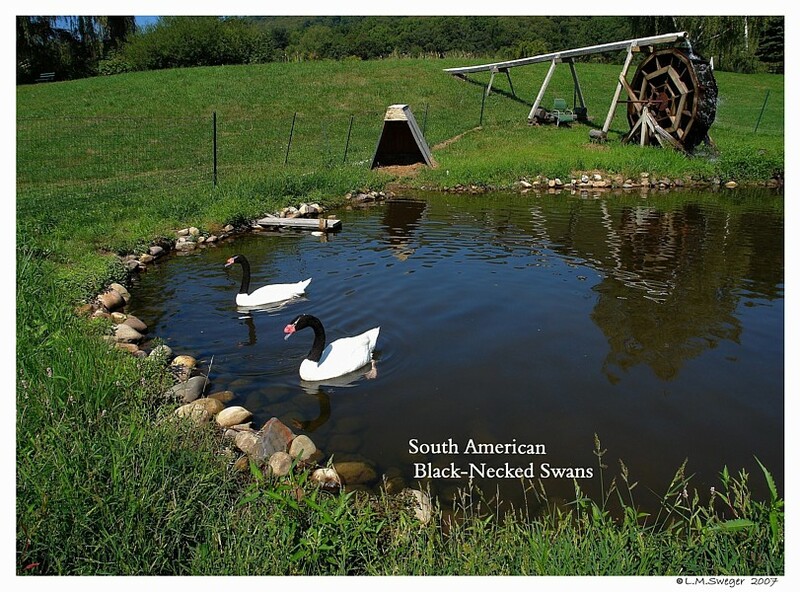 This Care would include any Captive Waterfowl – Ducks, Geese, Captive Trumpeter Swans and Black Australian Swans. 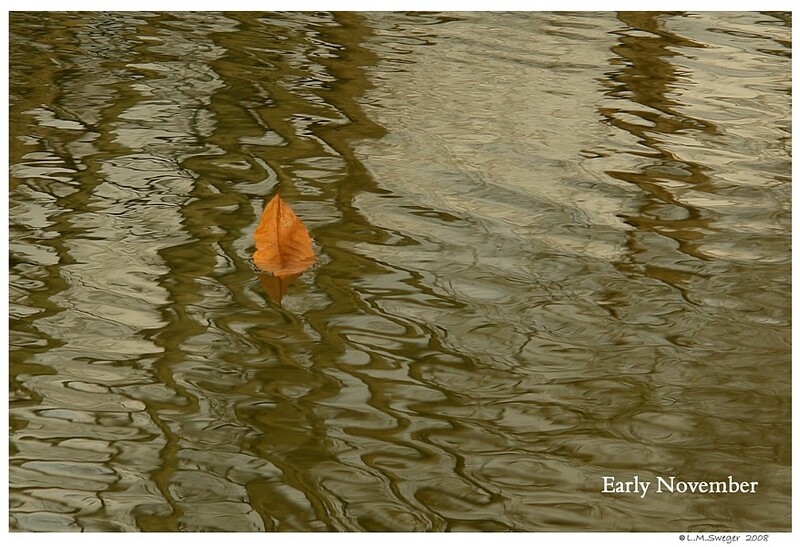 As Pond Temperatures Drop, the growth of Under Water Vegetation slows and will go Dormant until next Spring. 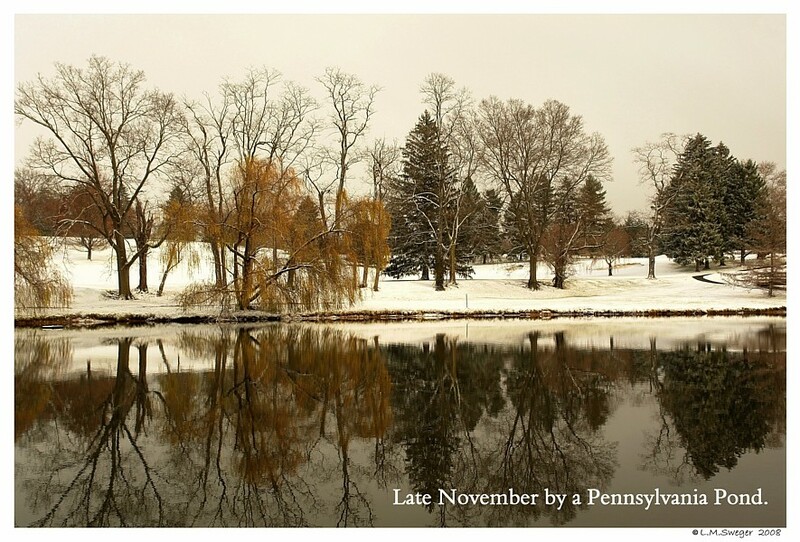 Lawn Grass will become Dormant..
Or when covered with Snow and Ice unavailable for Grazing. Water Insects and Under Water Critters hide in the lower areas of the Pond. 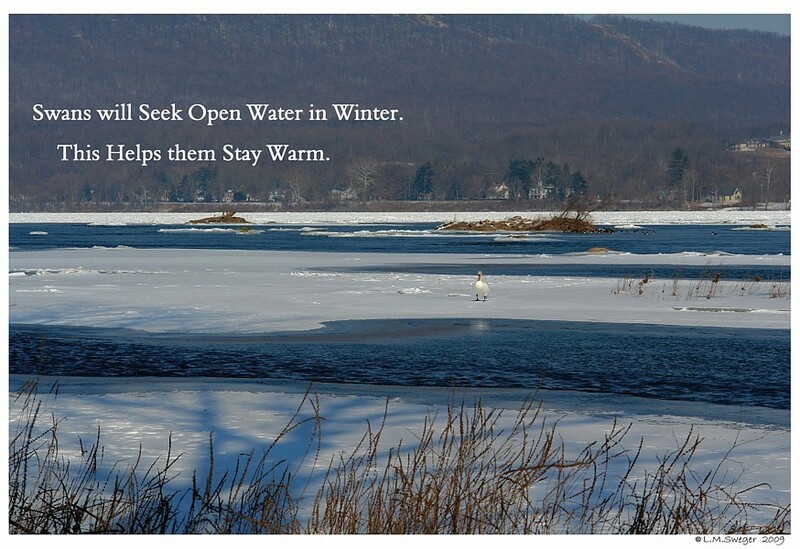 PLAN FOR OPEN WATER – A WINTER WAKE. 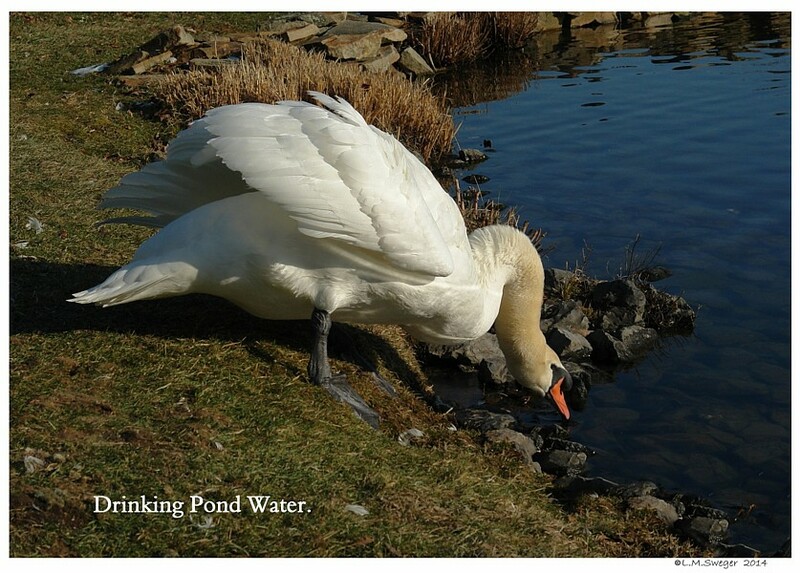 Healthy Swans do very well as long as they can keep their Feet in Liquid Water. Adds to the Brutal Conditions OUTSide..
Advisories are to TAKE ALL Animals into Sheltered Areas. 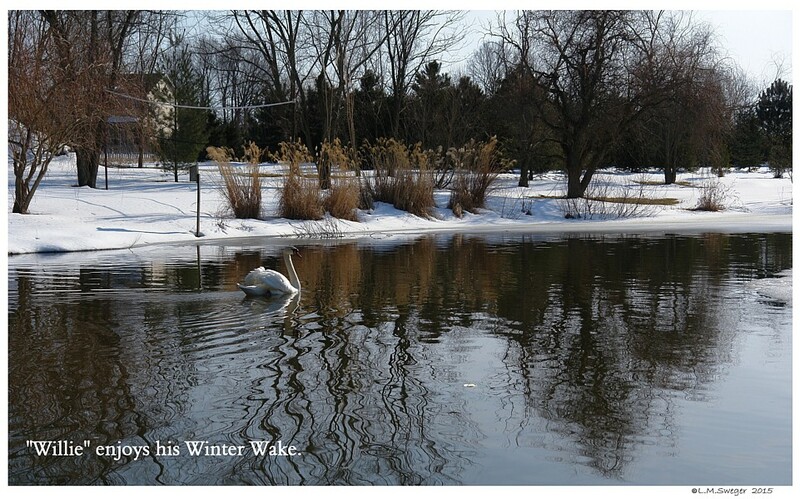 It is hard to see the Swans out in the Bitter Cold. 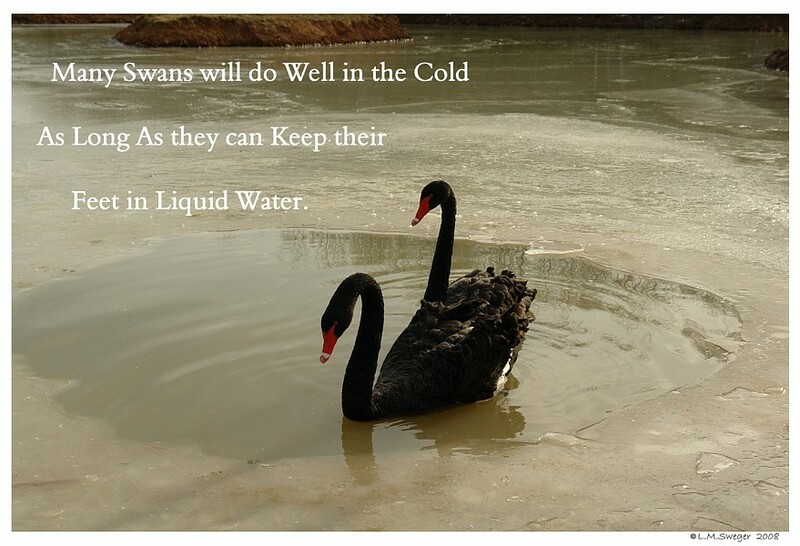 THIS Extended Bitter Cold is REALLY a Test of BASIC Swan Care. OPEN WATER and PLENTY of HEALTHY CALORIES..
AND the Judgement to Shelter or Keep Swans Outside in the Elements. and Each has its Own Variables to Consider. 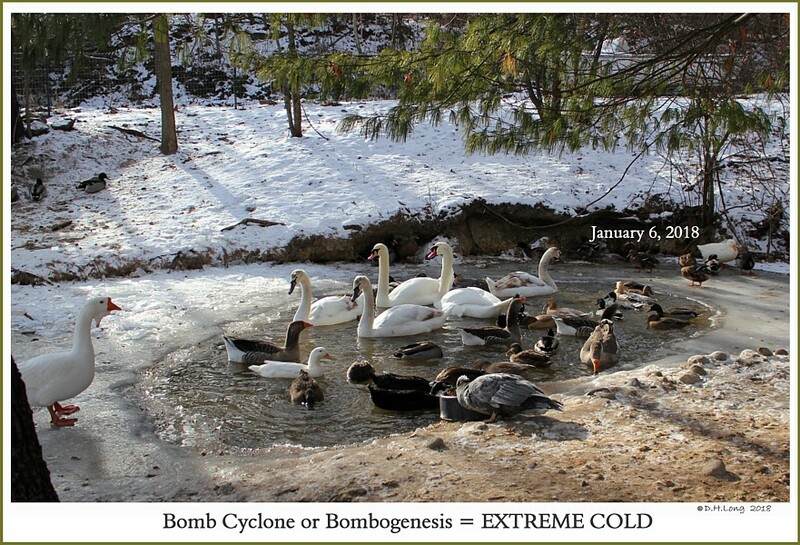 Sadly, this Bitter Cold caught some Swan Owners unprepared. 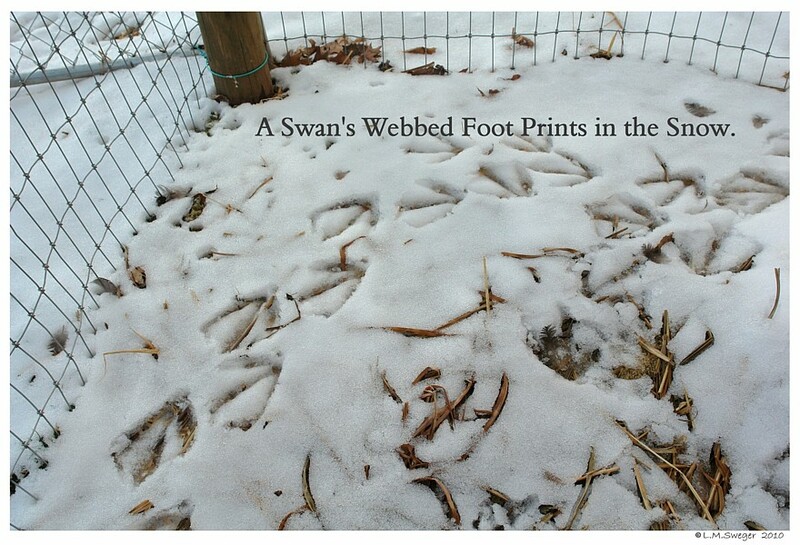 We learned of a Number who lost Swans. 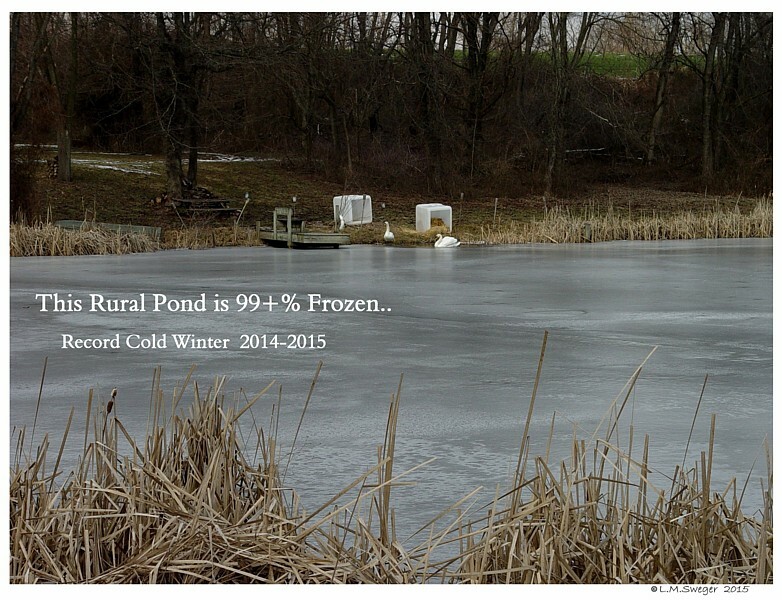 Ponds Froze that Never Froze in Years Past. 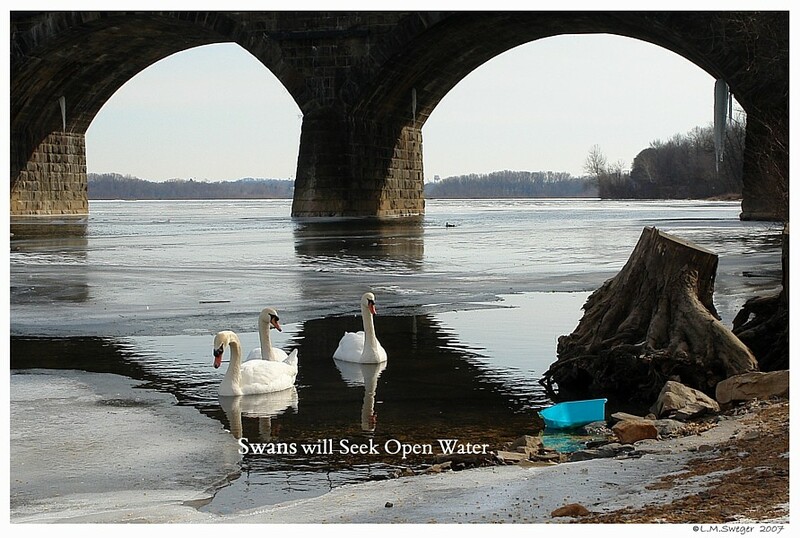 Swans Need some Open Deep Water Area to be Safer. 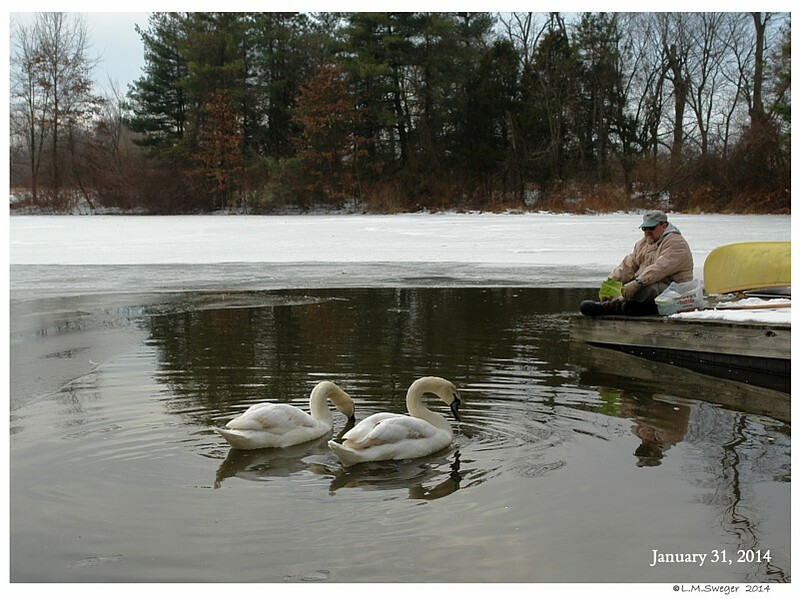 Winter Care will be Different for Adult Swans and Young Cygnets. 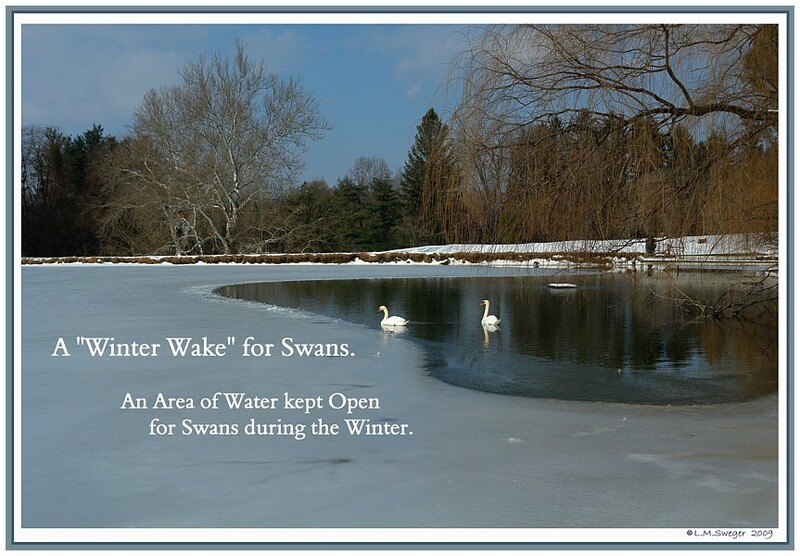 If they do not have a way to provide an Open Water Wake for their Swans… they arranged to Put their Swans Inside for the Cold Winter Months. 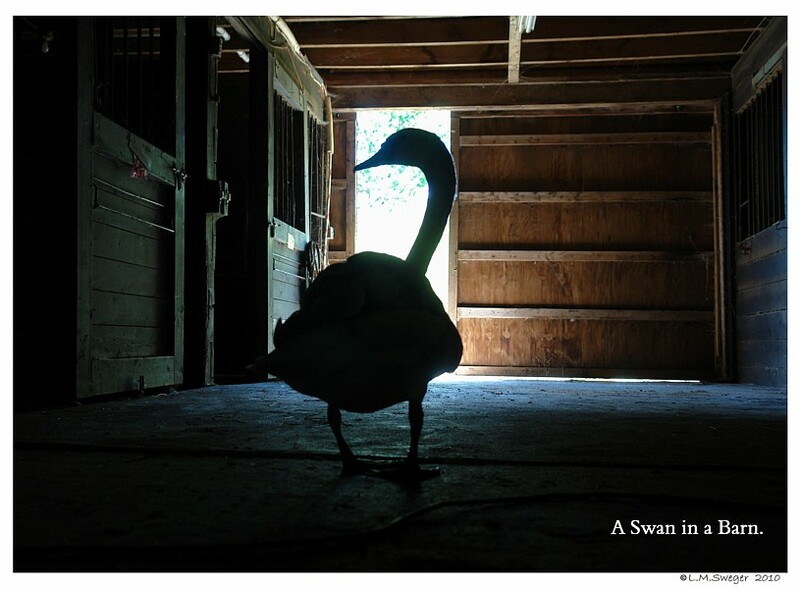 It had been an acceptable Practice to move Swans to a Farm and into a Barn or Stable for the Winter. Or Send them South to a Warmer Climate. 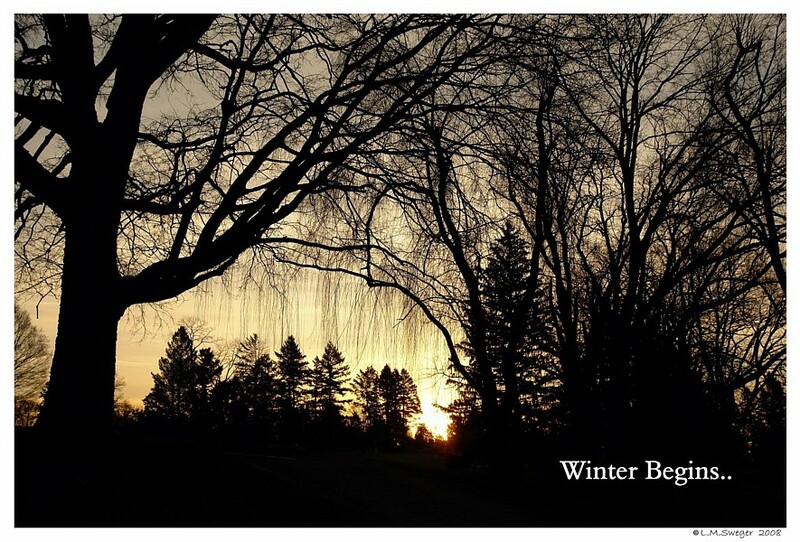 Examples: Public Parks or Golf Courses that are not Open during the Winter. 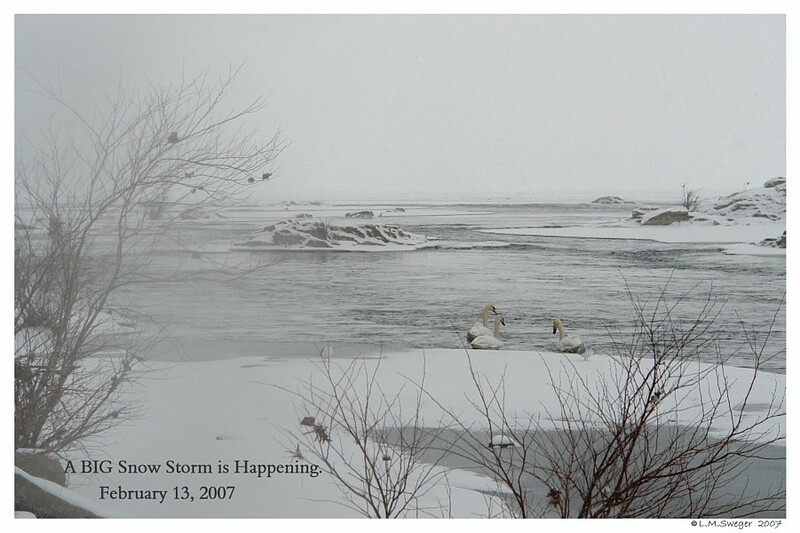 Or Northern Resorts Routinely Removed their Swans during the Off Season. 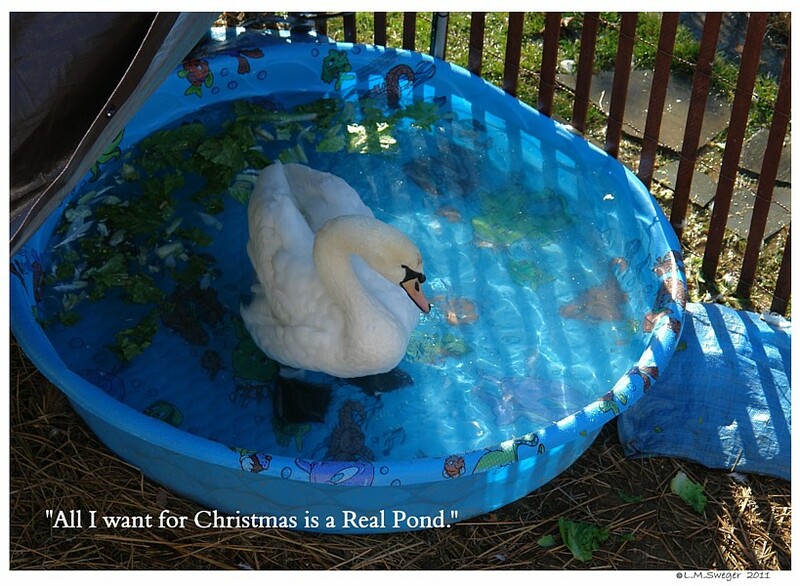 Or Private Swan Owners who live in Areas where their Ponds Freeze moved their Swan Inside. Yes, it sounds logical… But, Experience and Statistics have changed the Practice over Time. 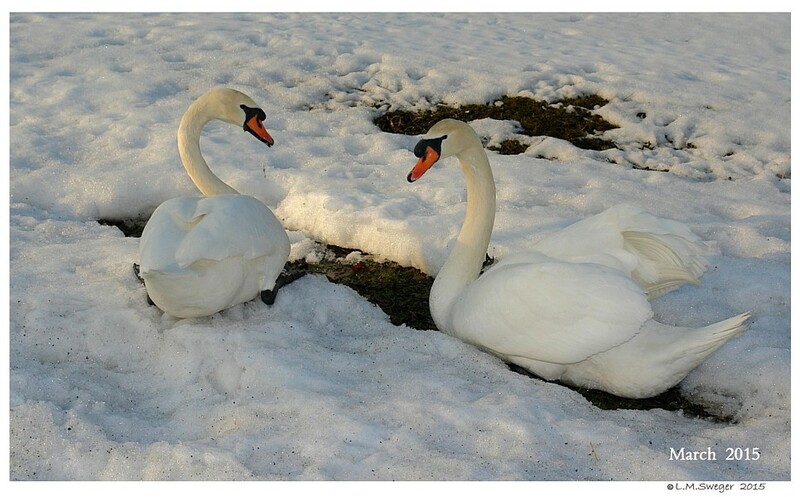 Once these Wintered Swans were returned to their Ponds in the Spring, to the dismay of their Caretakers, a Percentage of the Swans became Ill and Died. 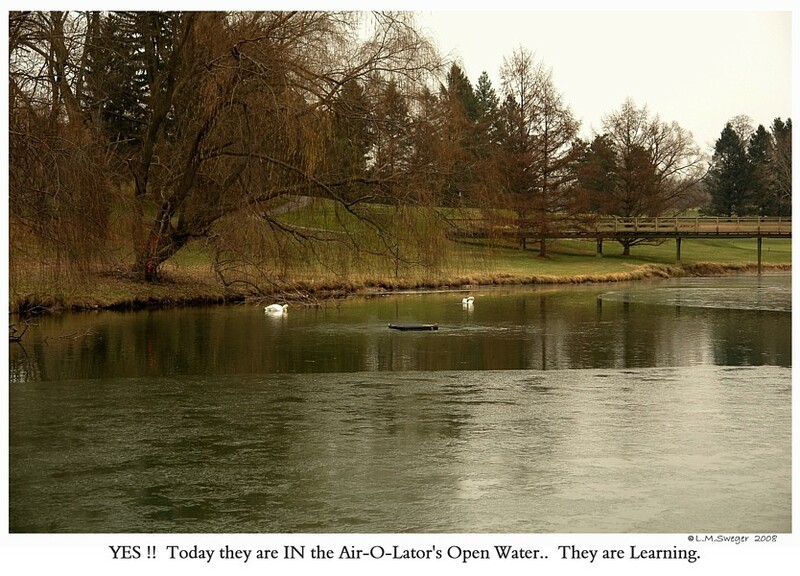 Veterinarians began to realize the Swans kept Outside on Open Water Ponds fared much better. 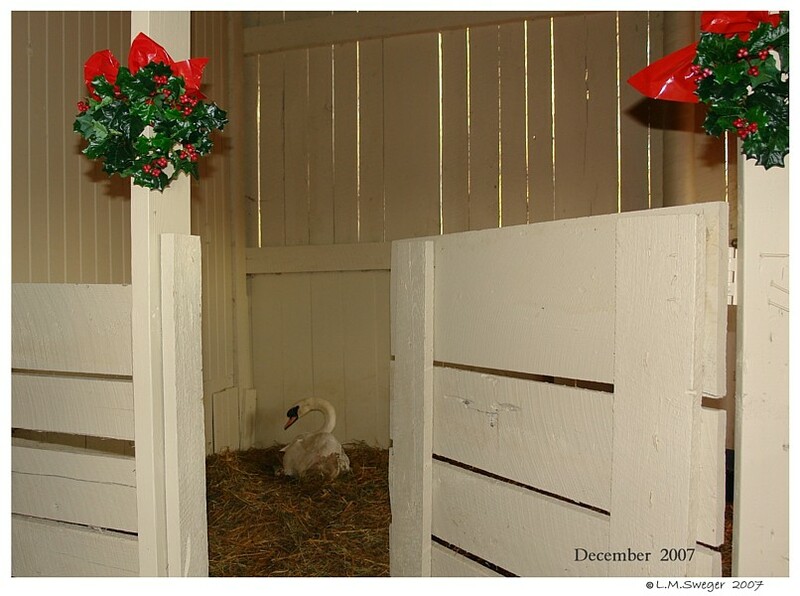 The Swans were often kept in a Sunless Shelter for Two to Four Months. 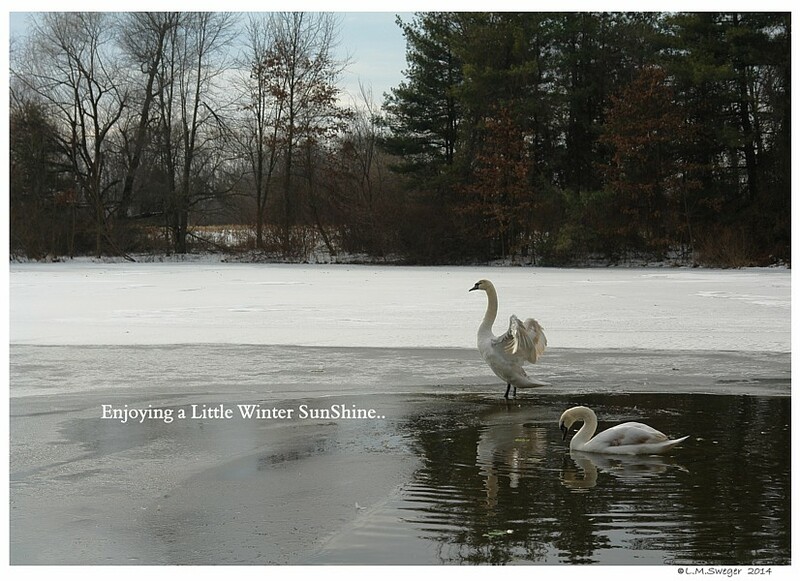 The Lack of SunLight for several Months will Deprive the Swans of the Sun’s Important Benefits. Being Sheltered at Night and allowed Time Outside in the Sun on Nice Days would be a Compromise from being Inside Day after Day.. So Many Variables. 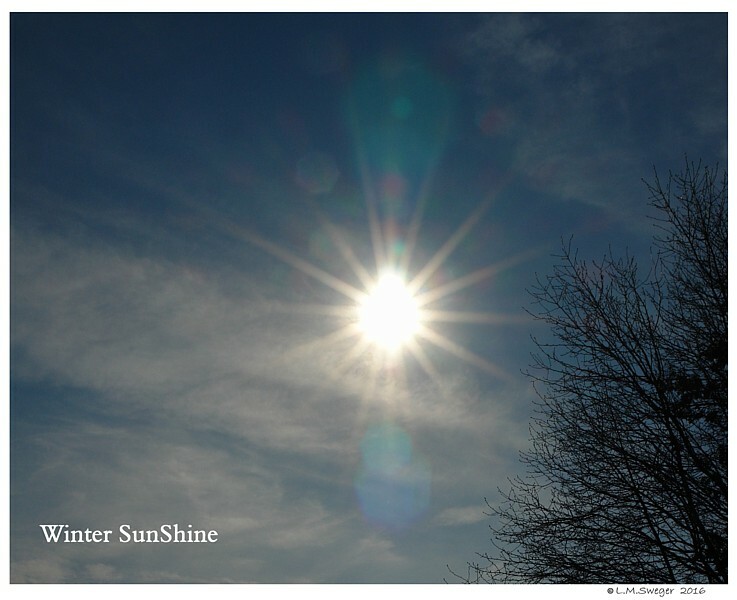 Exposure to SunLight aids Natural Vitamin-D which plays an important Role in Immune Health. A Deficiency of Vitamin-D increases the Rate of Illness and Infections. 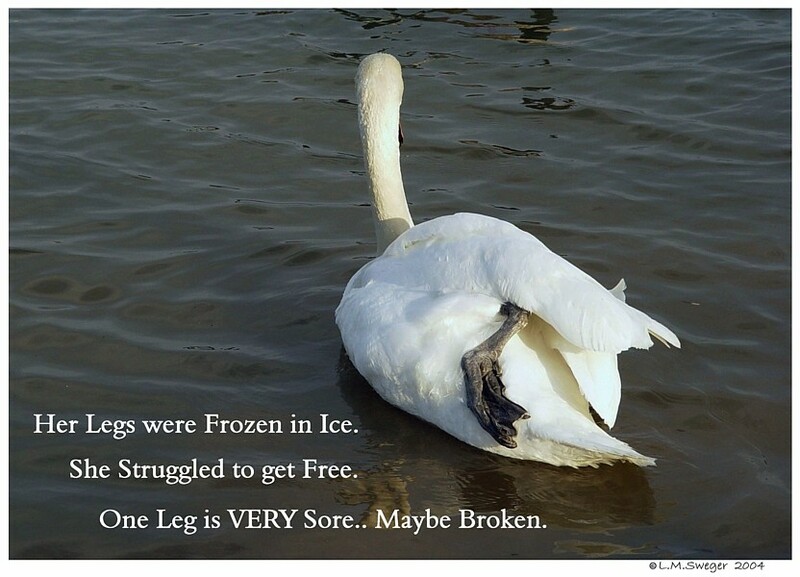 Inside for several months the Swans may develop the same Physical Problems Humans do without SunLight.. IF kept inside, they would Benefit from Vitamin Supplements. And LOTs of Vegetables. Check the Feed you will give for the Vitamins and Minerals Added. Vitamin-D is Important for Bone Health by aiding the Absorption of Calcium. Lack of Vitamin-D may weaken their Leg Bones, contributing to various Problems. 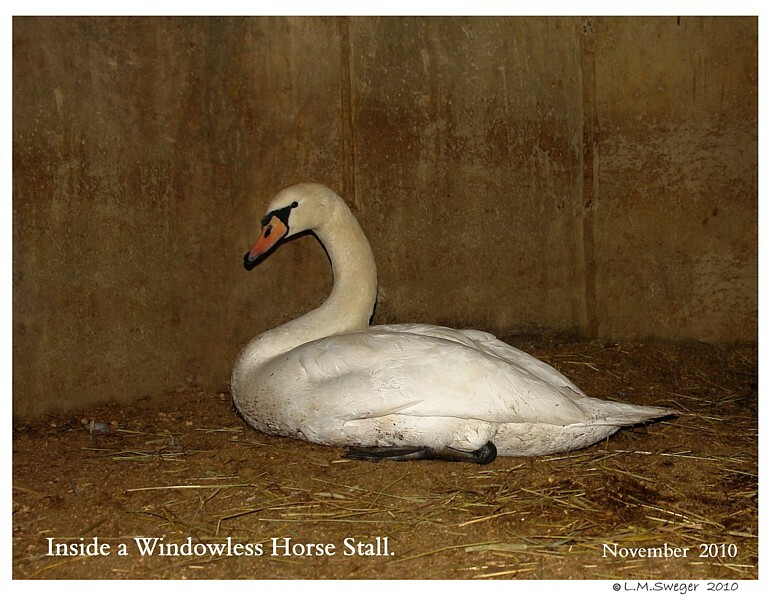 Sheltered Swans are NOT getting much Exercise in a Small Barn Stall. A Lack of SunLight and Freedom can lead to Depression. 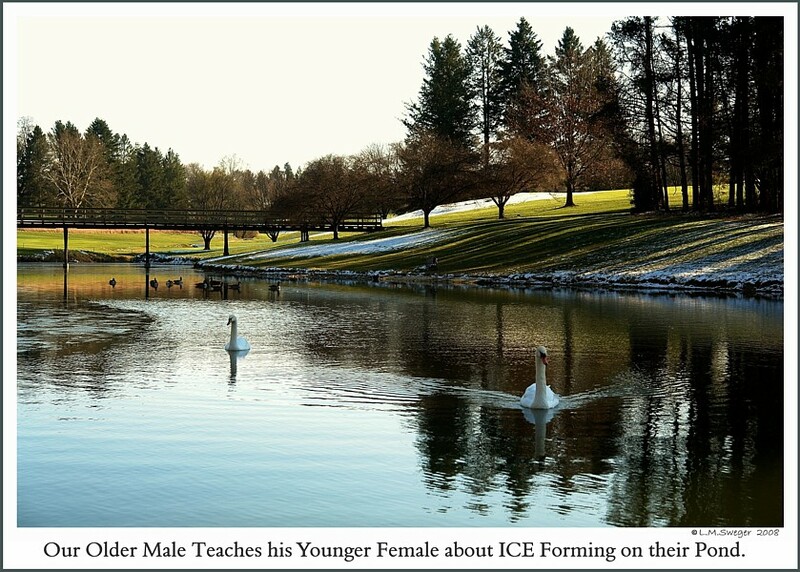 The Winter Months are when Swans’ Reproductive Hormones are starting to Increase. 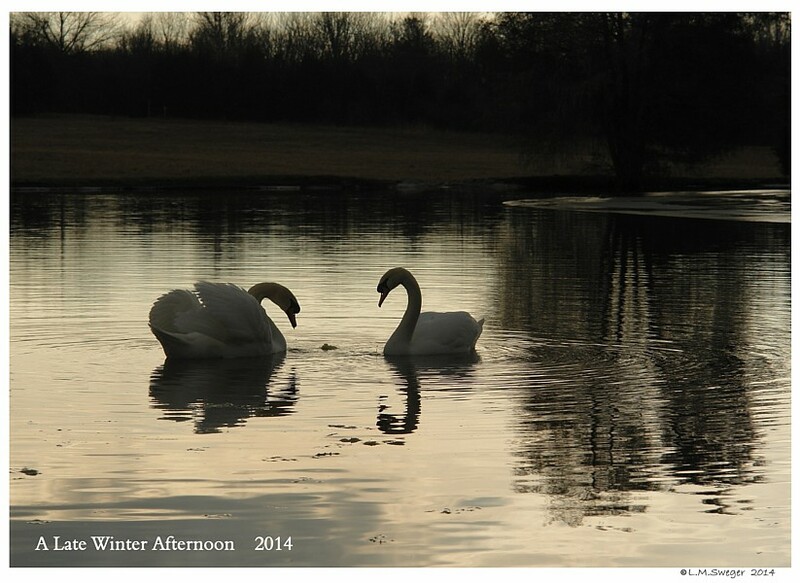 They should be Courting, Mating, Enjoying being Swans. 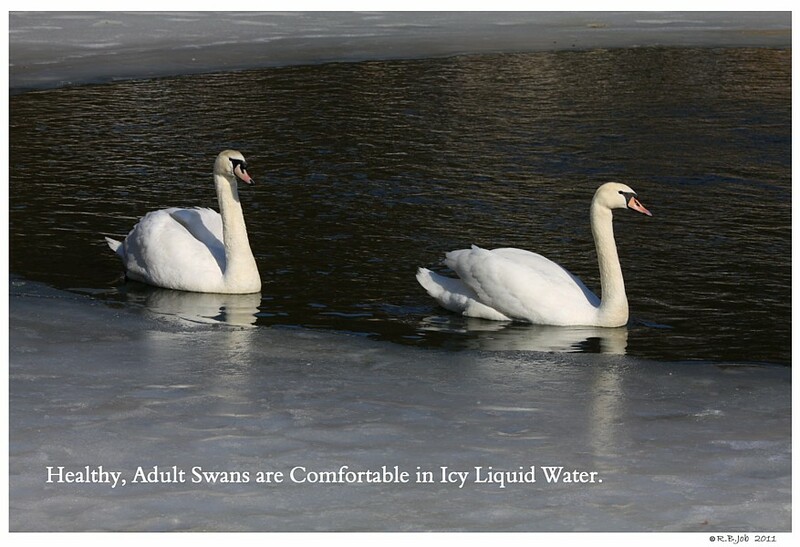 Swans Need to have their Immune System stimulated Constantly. 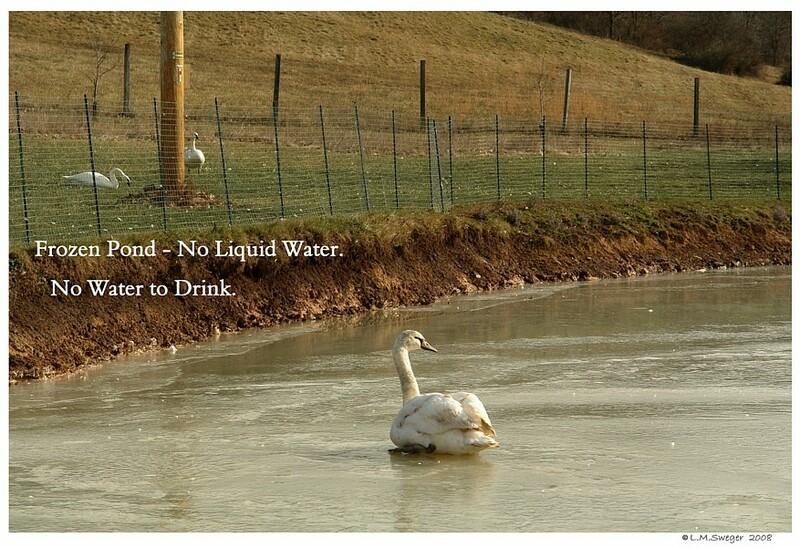 They normally drink the Water in their Environment, Ponds, Lakes, etc. There is Nothing Clean about the Water they Drink ! ! It is Full of Bacteria and who know what else. YUCK !! This Pond Water keeps their Immune System ACTIVE.. Robust. 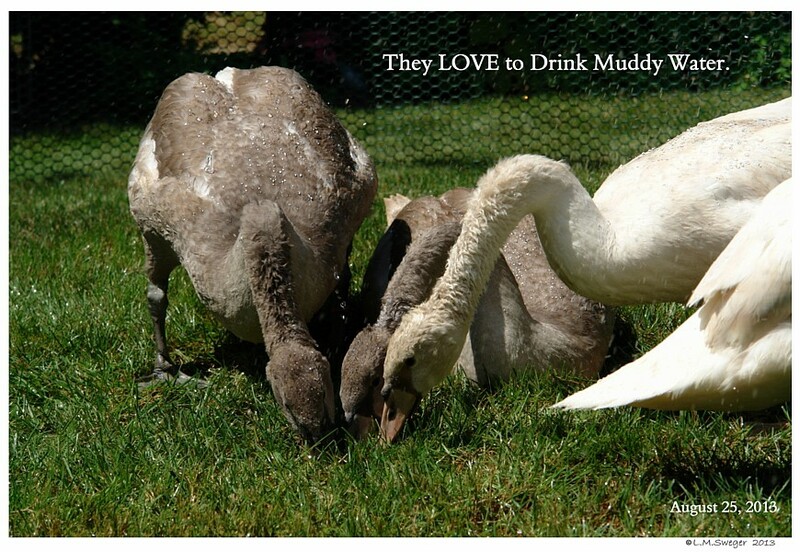 Many times in our Backyard, we watched Swans and Cygnets SUCKing into small Muddy Puddles every chance they would get. 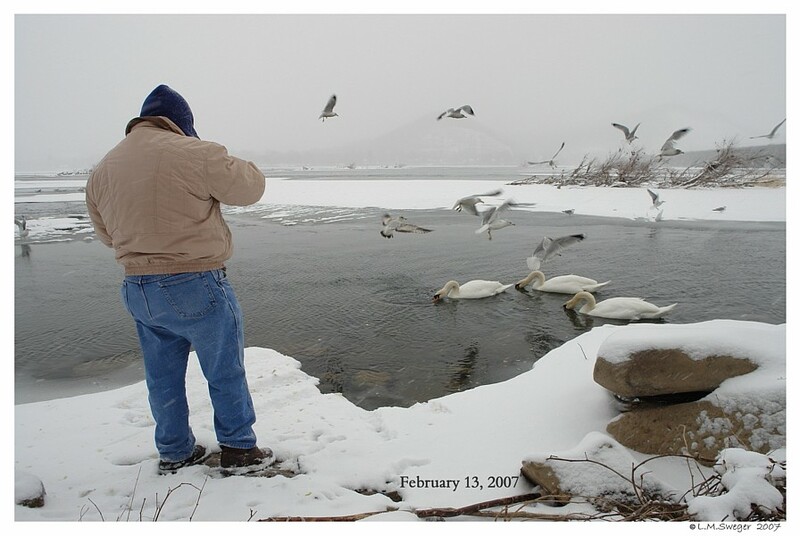 Many routinely DUG into the Dirt near the Kidde Pools and Scooped Beaks Full of Dirt into the Clean Pool Water. At first it was Exasperating trying to keep their Water Clean. Reading and Observing I finally realized, they Instinctively CRAVE the Bacteria and other Microscopic Organisms in their Environment.. 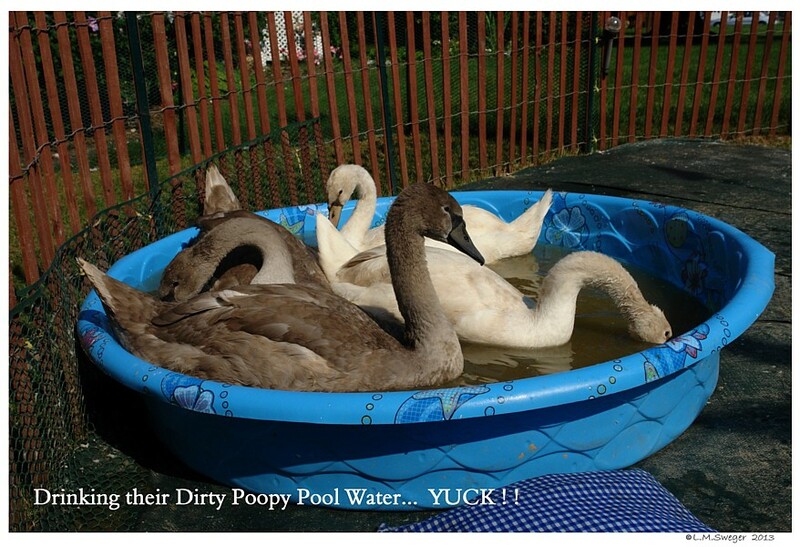 I frequently observed the Swans drinking the Cloud of Poop they expelled into the Pool Water. And not just their own, but from another one who had just added their Poop to the mix. YUCK, YUCK, YUCK ! ! It is TOO Clean – long term. 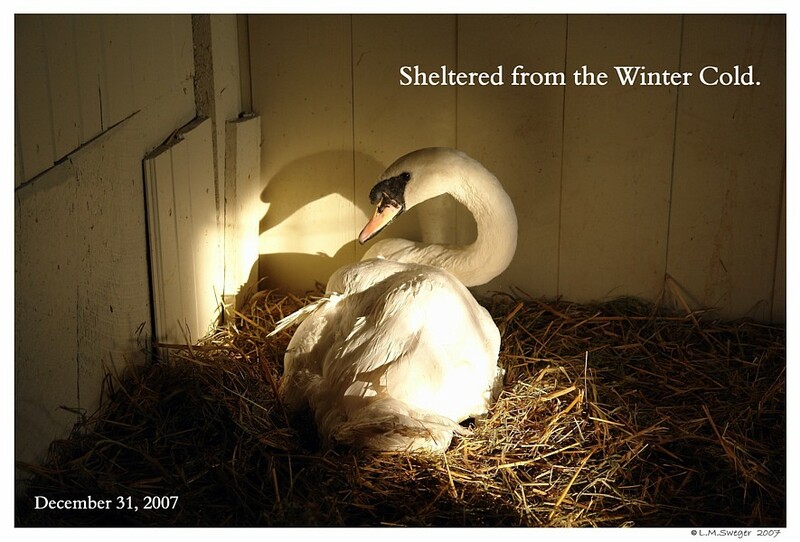 IF You do Shelter your Swans during the Winter Months.. Try to Bring them Pond Water several times a week.. 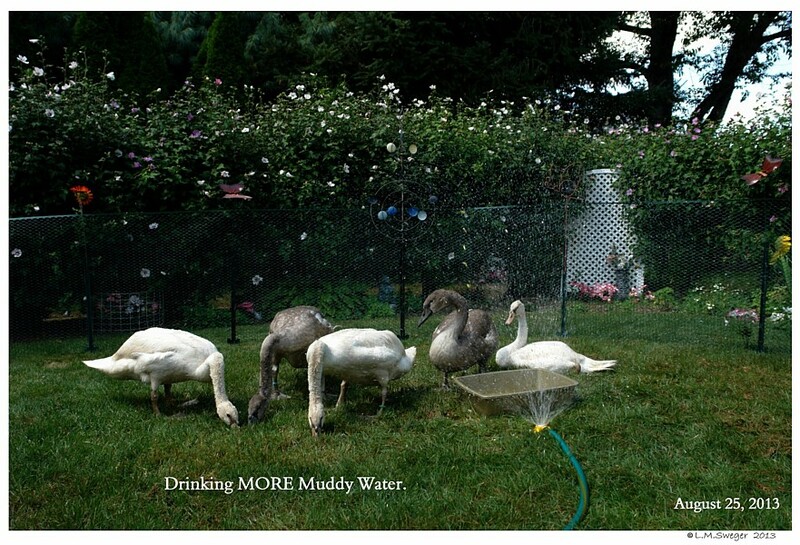 It is More Important to be SAFE then to bring Pond Water to them. 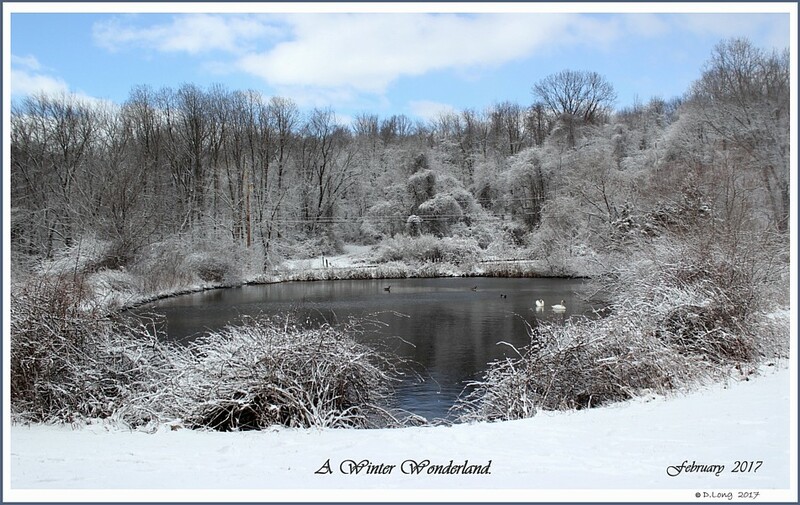 When your Pond is FROZEN Solid, you might ADD some Dirt from near the Pond to your Clean Tap/Well Water ..
DO NOT USE Water from a Hot Water Tap for Drinking. This may Contain Dissolved Heavy Metals. 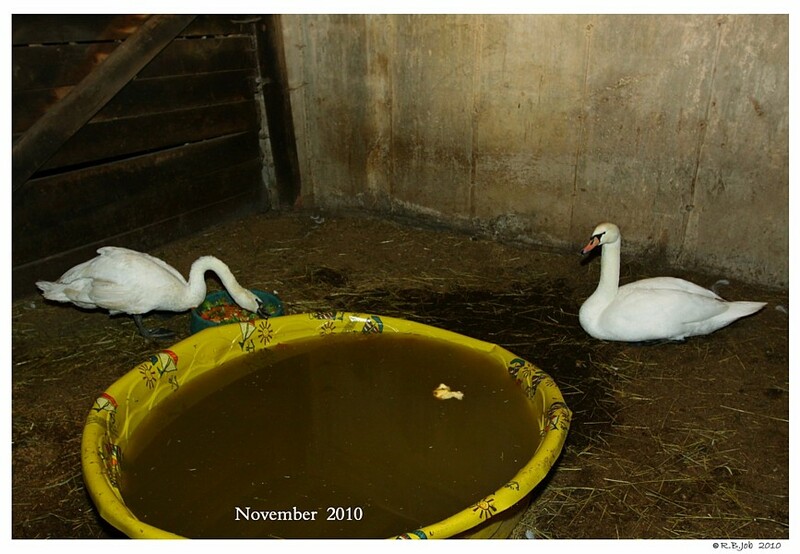 Water Buckets in a Barn can still Freeze, leaving the Swans with nothing to Drink. 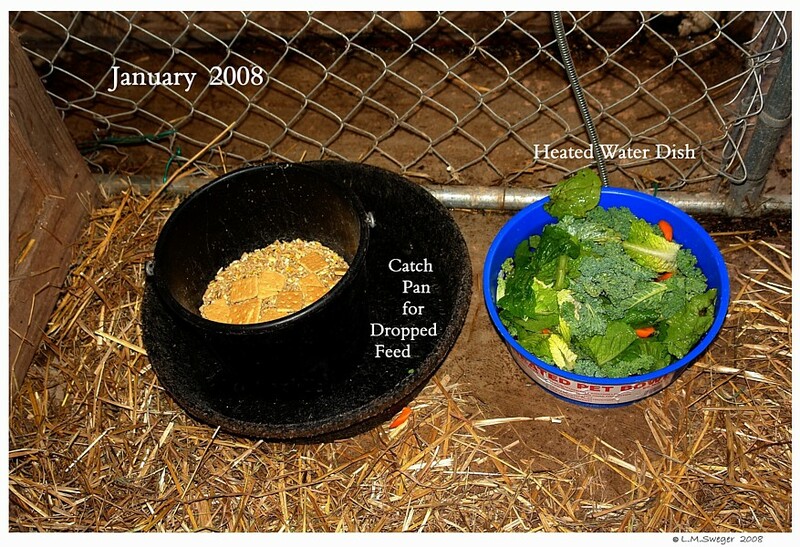 There are heated Water Dishes available from Farm Suppliers. Check their Living Area for Sharp Objects and Tangle Hazards. 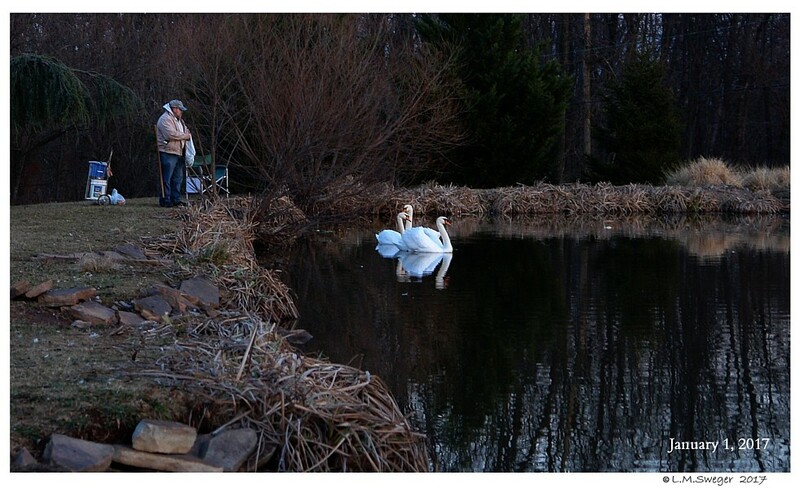 Swans get Bored and will TEST Everything. 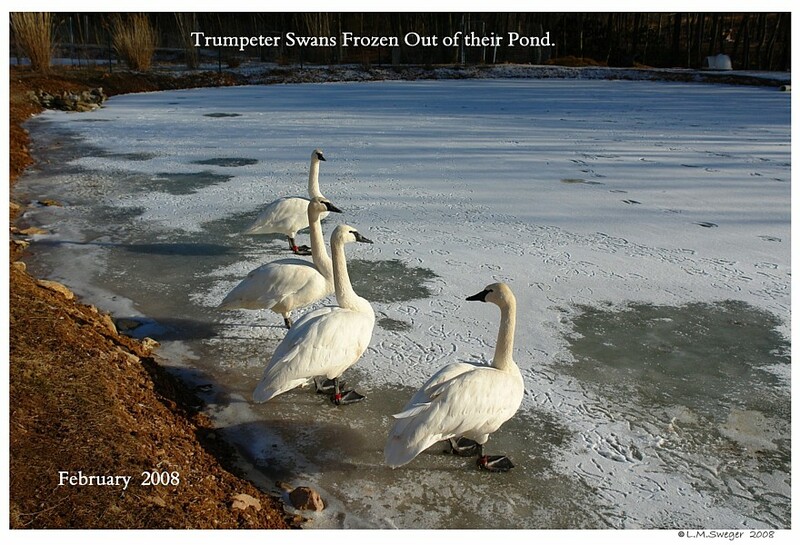 Swans, especially the Trumpeters and Mutes HATE being confined in a Building or Shelter – they feel TRAPPED. – to Fly Away or to FLOG !! Pinioned Swans can not Fly to Escape Danger.. In a Building they can not Spread their Wings and Flog to Drive Off Predators. It is TOO easy for them to become Cornered. 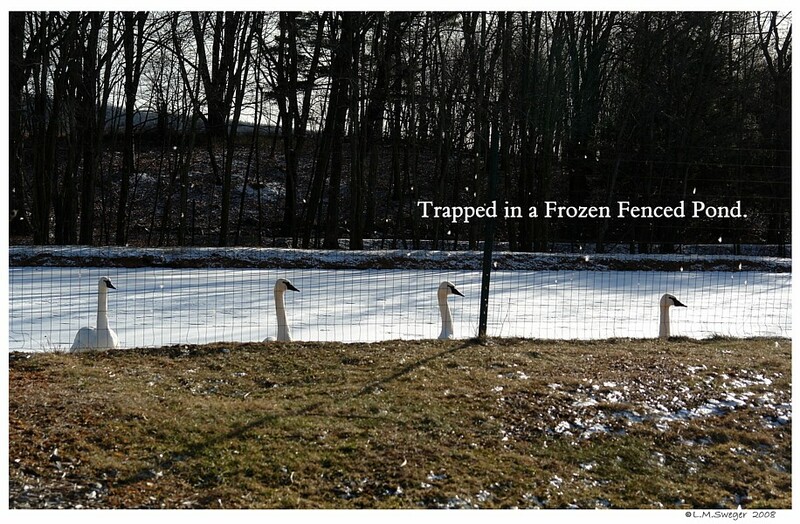 If you Shelter your Swans be sure to Close and Secure the Door when they are inside. 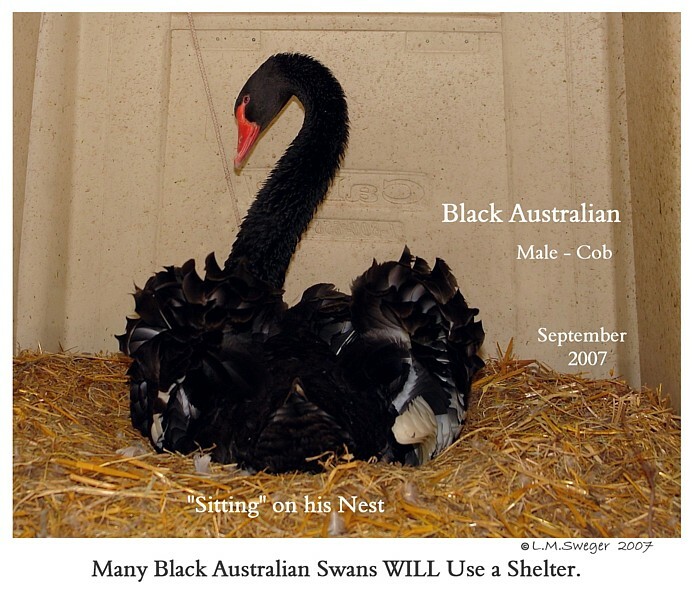 The Smaller Swans.. Black Australians and Black Necked Swans have a harder time with Exposure during the Winter. They will be more willing to Shelter at Night. Be sure to Secure the Door for the Night and let them out in the Morning. 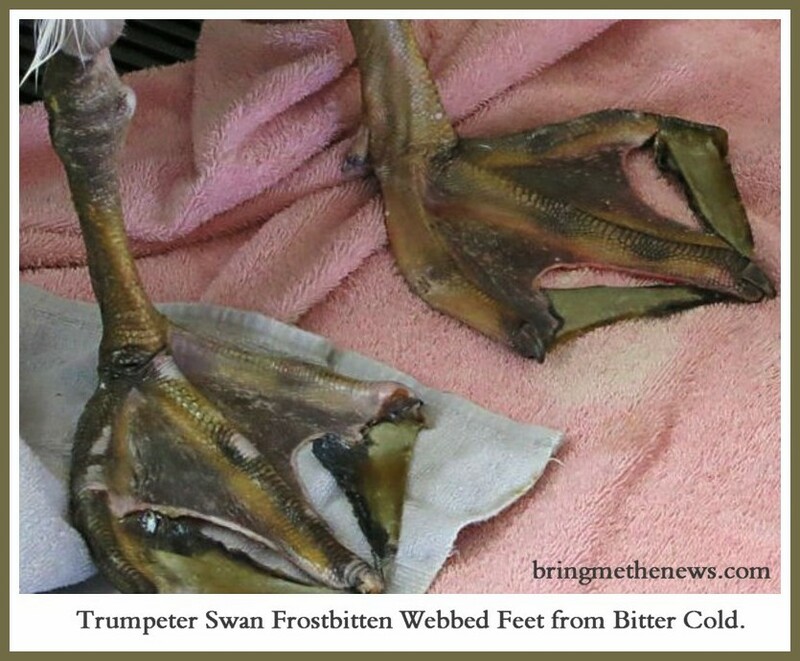 ALL Swans are Subject to Frost Bite – Especially their Feet. This will NOT Happen with their Webbed Feet in Water. Swans are BIG VERY Messy Birds..
LOTs of POOP Waste to Clean-Up.. Another BIG PAIN !! Their Enclosures get DIRTY Fast. Kidde Pools need almost Daily Cleaning. YUCK ! ! 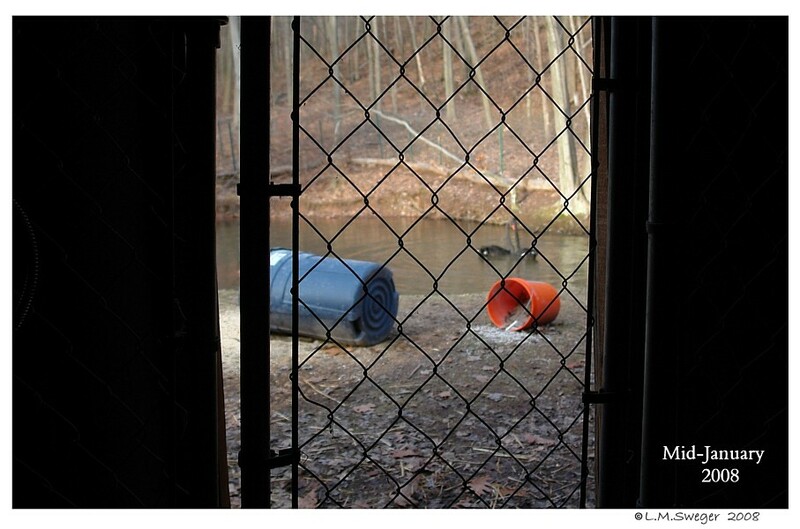 Having a Kidde Pool inside a Shelter is DIFFICULT to DUMP !!! A Barn Stall with Straw for Bedding is a Pain to keep Clean and Dry. Dirty, Wet Bedding-Straw will develop all kind of Disease Risk.. Molds promote Air Borne Diseases. Respiratory Diseases are Common. 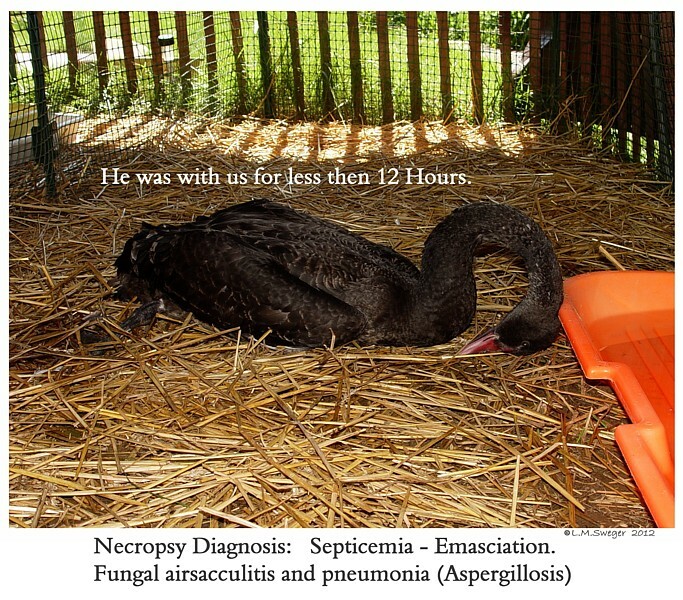 Aspergillosis is a common Fungal Disease that infects the Respiratory Tract of Poultry. 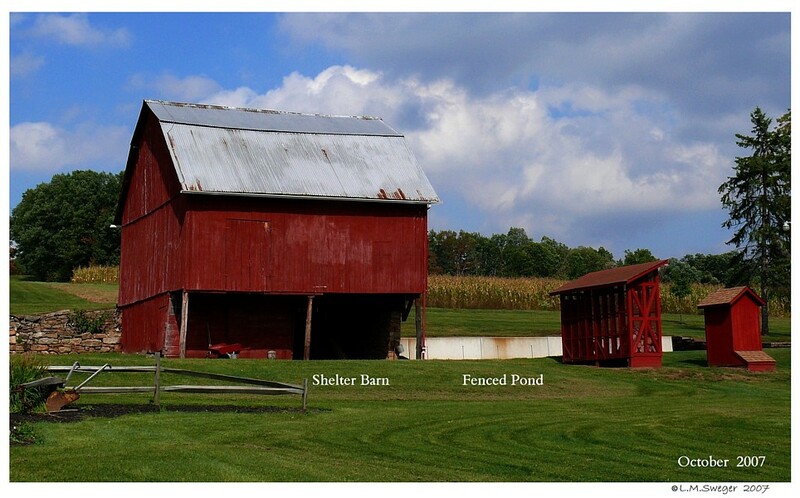 It is associated with Moldy Straw and has a Higher Incident if Hay is used for Bedding. The Consequence is Increased Mortality Numbers. 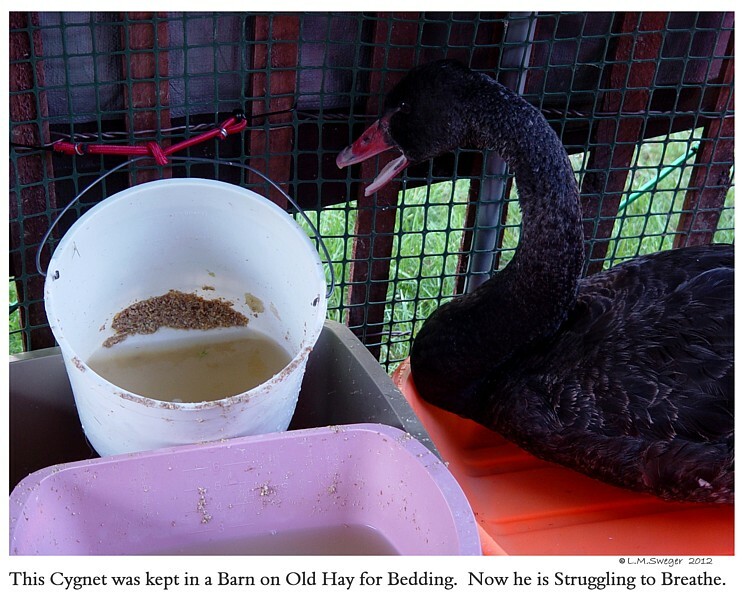 Hay used as Bedding is especially prone to developing Aspergillosis Spores. 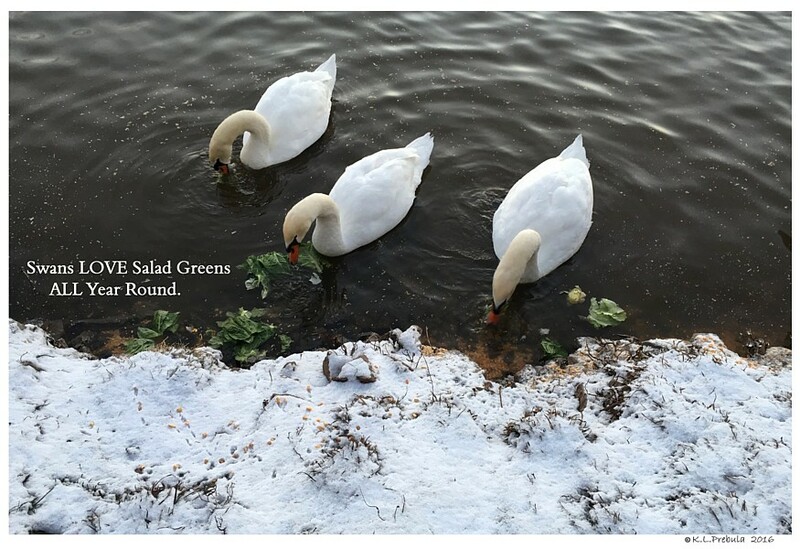 Then there is their Feed… Swans do not eat all their Feed at one time. They are MESSY when Eating from Containers..
LOTs of Spillage to the Floor/Ground. Barn Rodents become a problem. Rodents soil their Feed with Urine, Dropping and Saliva. 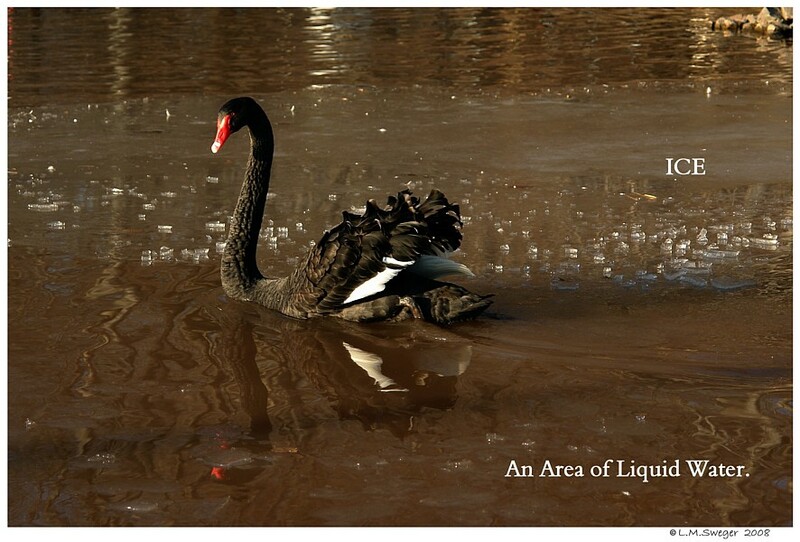 Various Diseases are spread to the Swans this way. YUCK ! ! 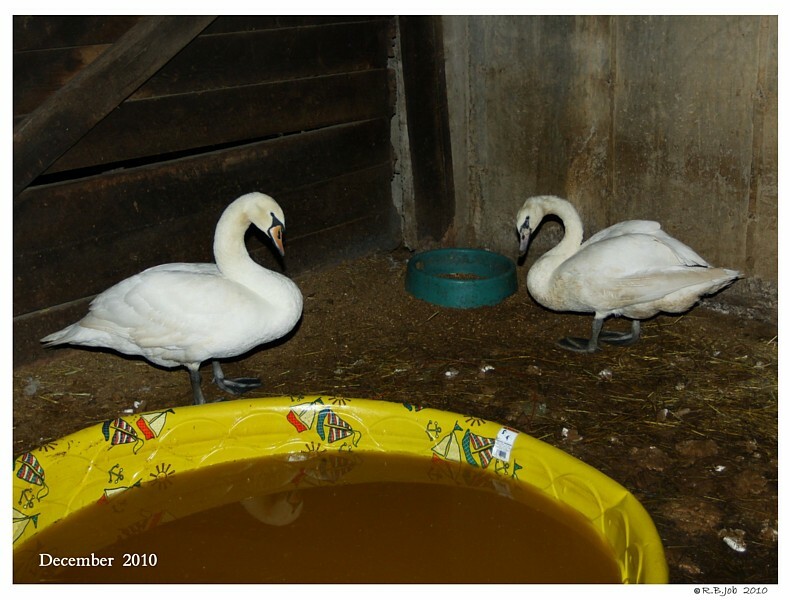 Consider the Swans’ Emotional Well-being..
Swans may become Very Depressed when they are not able to be Outside or in Water. They need to Bathe to keep their Bottoms Clean and to encourage Preening. 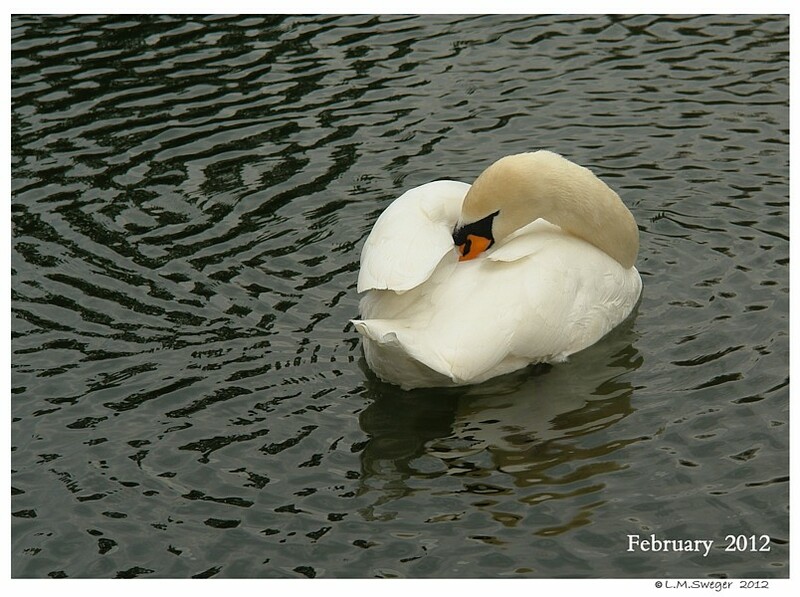 Swans seem to need to be Wet to Preen Normally. 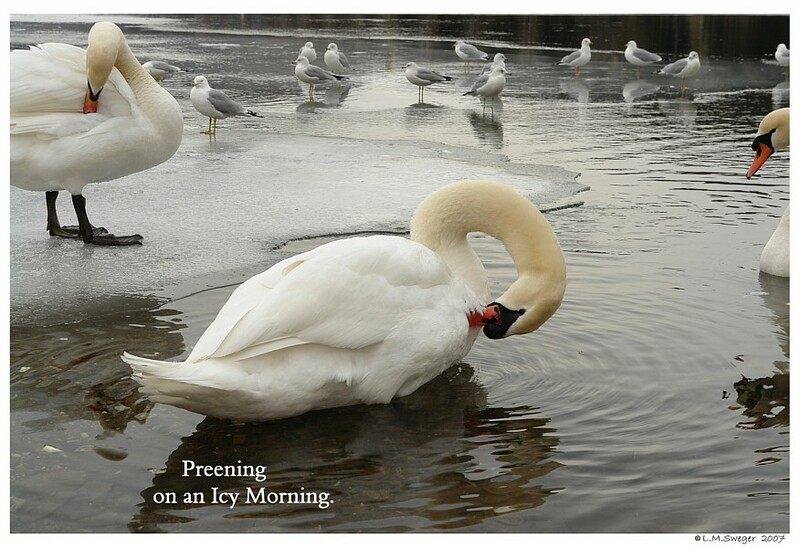 Preening helps condition their Plumage for Insulation and to maintain WaterProofing. 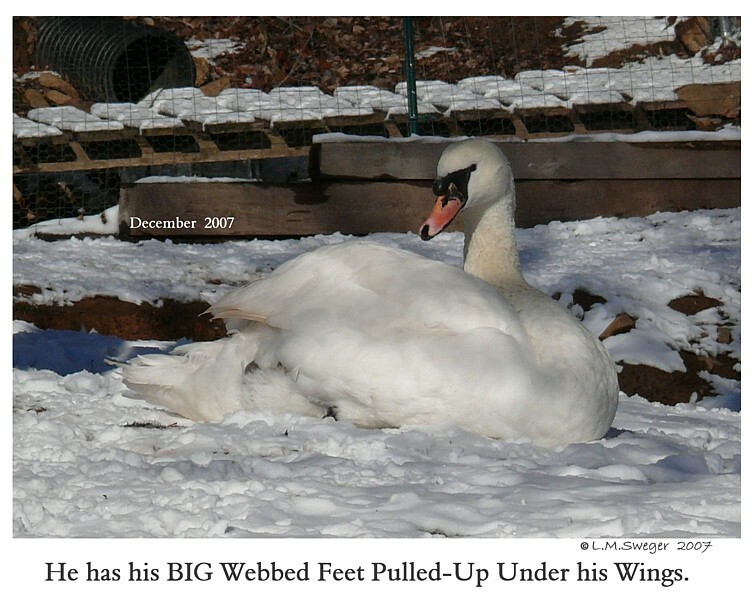 The Swans’ Plumage has an Excellent Insulating Factor..
You will likely see the Swans tuck their Feet up under their Wings at times. 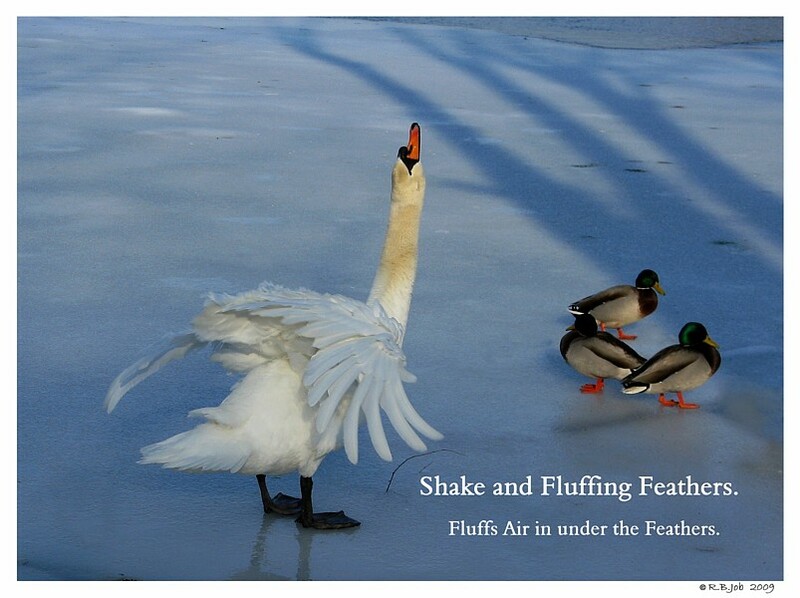 This allow them to Warm their Feet in an area where the Feathers are not so dense. 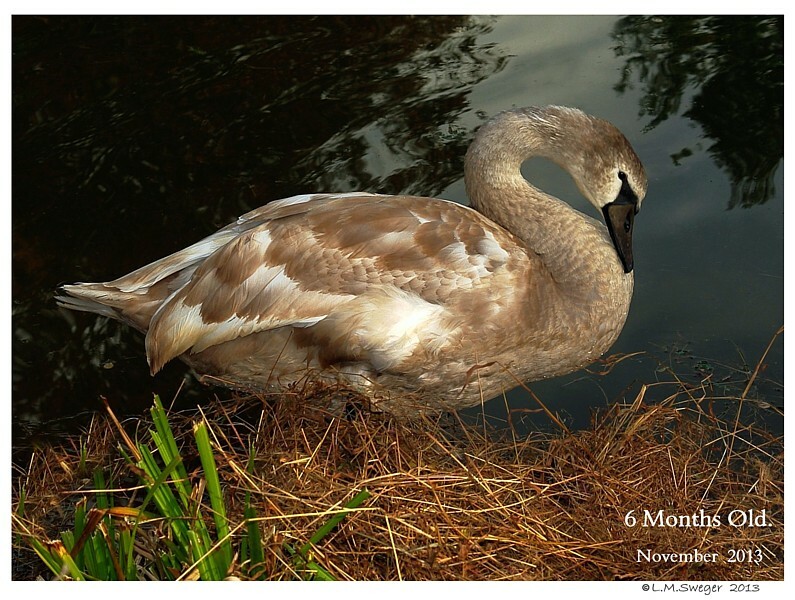 Swans have a Normal Body Temperature of 106 degrees F.
At Night, they will often Snuggle their Beak under their Feathers. 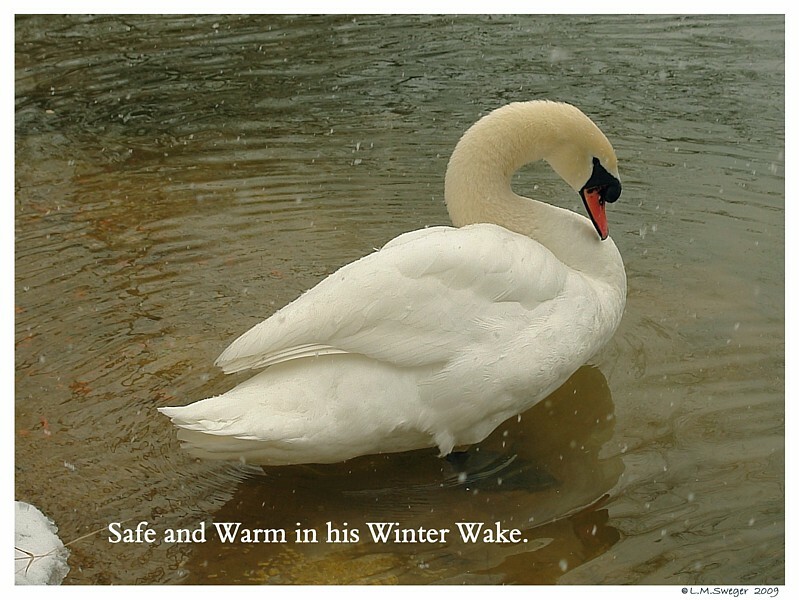 In Severe Cold, it is possible for the Watery Fat in their Knob to Freeze. This may result in a Pinkish Scar. I have only seen this once. 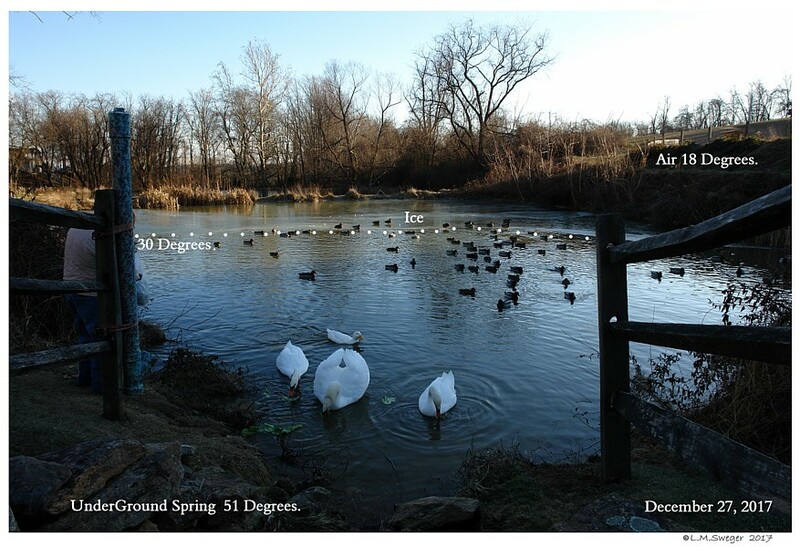 Waterfowl have Evolved to Conserve their Body Heat. 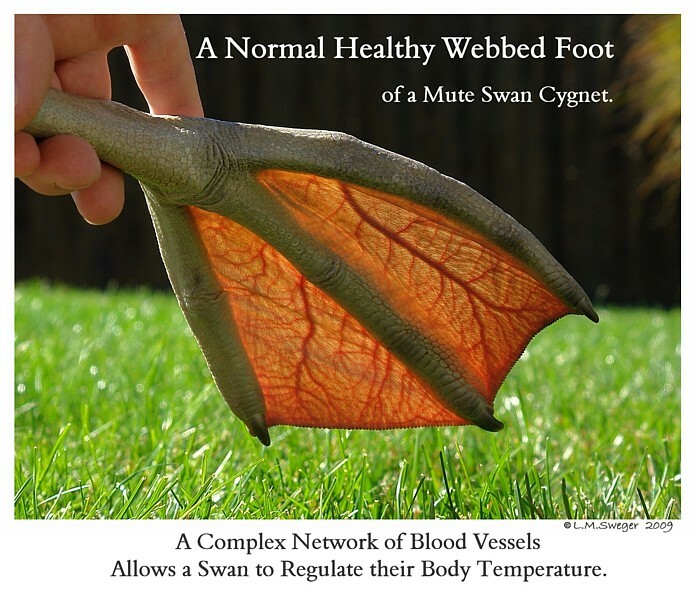 Some mechanism in their Feet allows their Blood to flow through their Webbed Feet and not lose Heat. are able to keep Warm. Nature’s Magic. 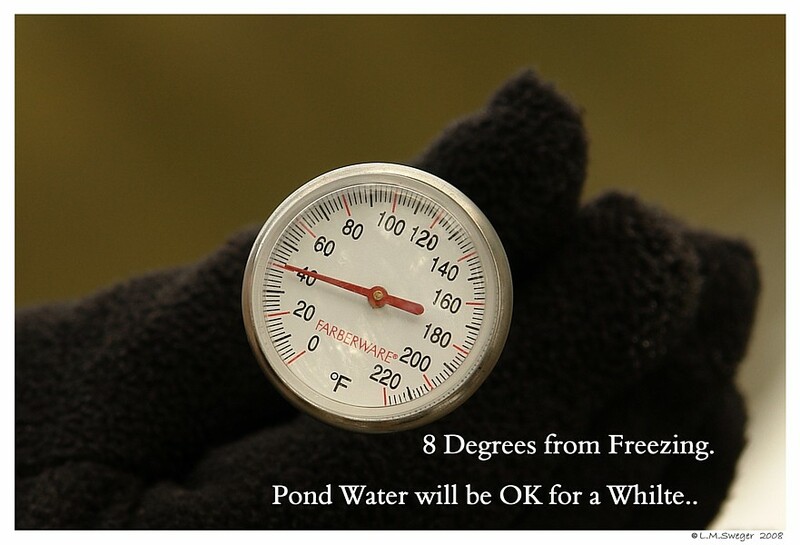 Cold Liquid Water is Warmer then the Temperature it Freezes at. Air Temperature plus Wind Chill may be MUCH, MUCH Colder ! ! 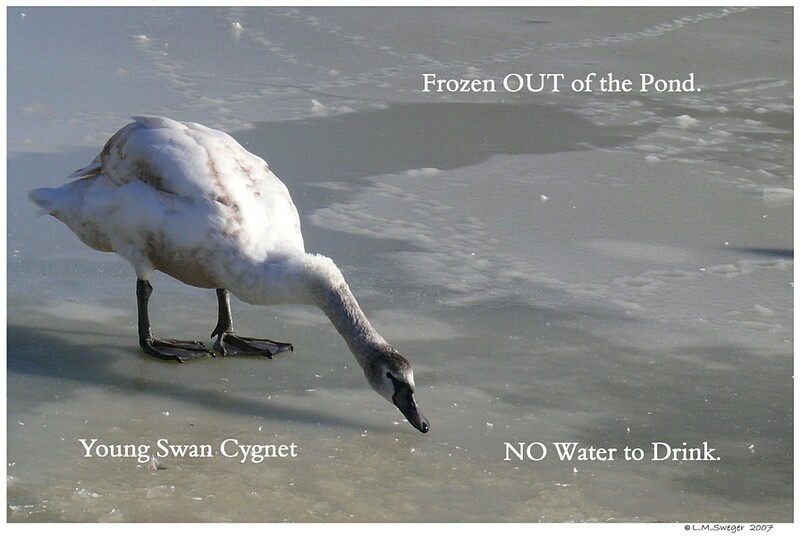 If Swans or Cygnets are “Frozen Out” of their Water then they are subject to the Air Temperature and if it is Cold enough, they may Freeze. 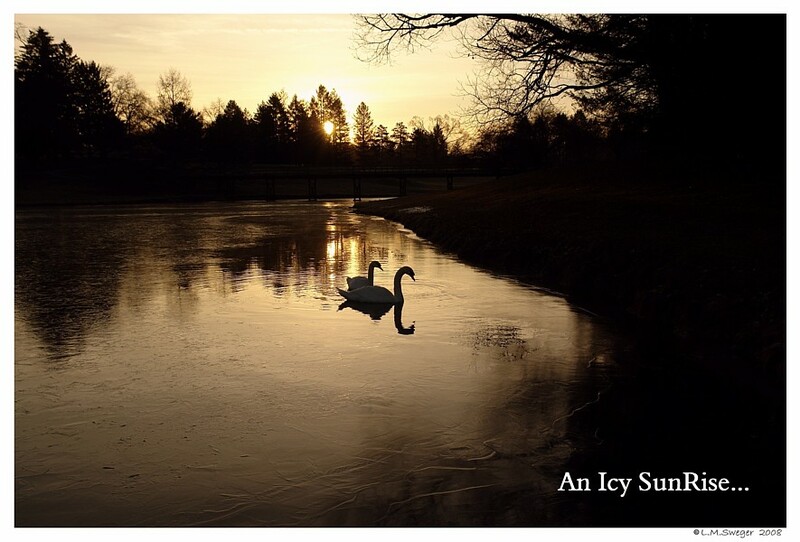 I DO Know of Swans that Froze.. 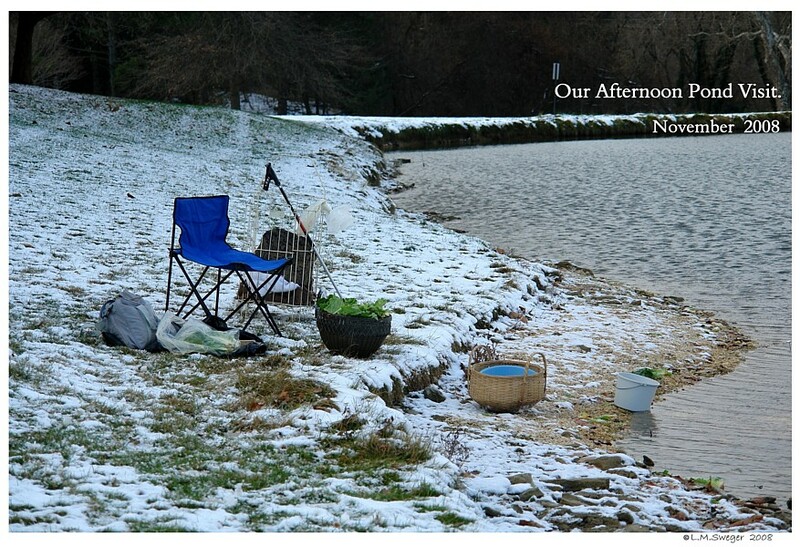 They are Helpless when they do NOT have Enough to Eat and their Pond has Frozen. 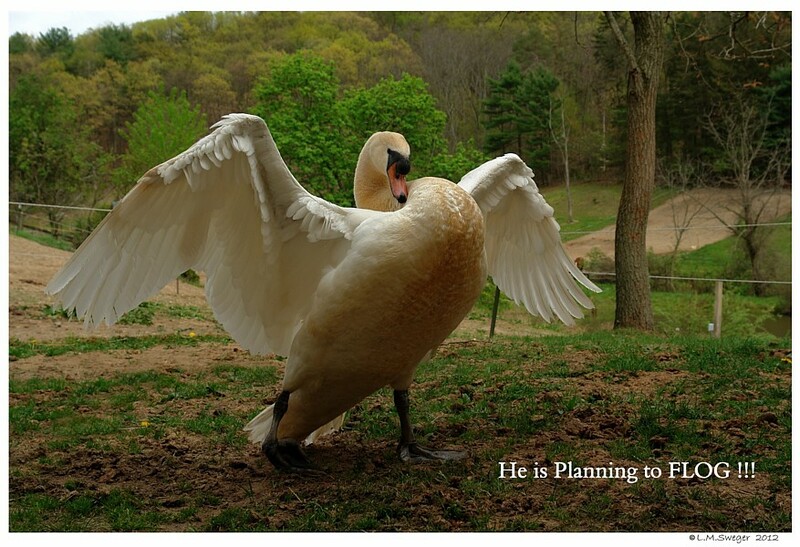 In the Wild, Full-Winged Swans will fly to find Open Water. 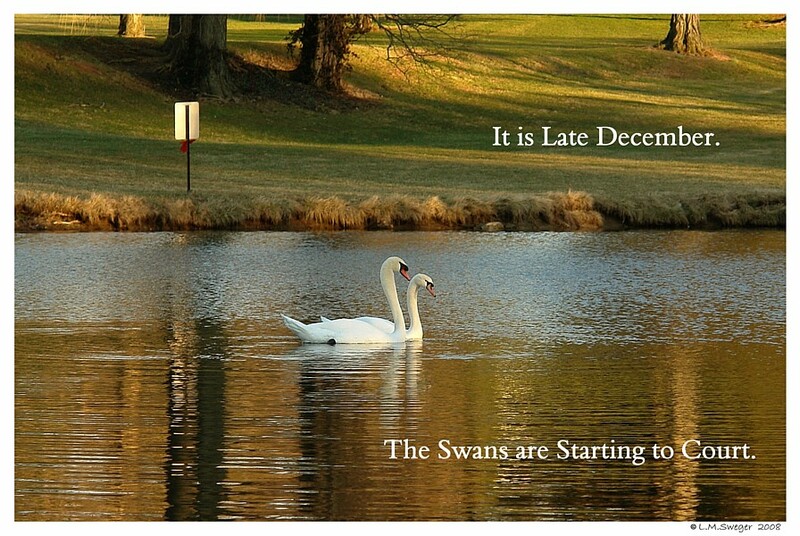 Mute Swans are NOT Migratory Swans.. they will only Fly to Find OPEN Water. 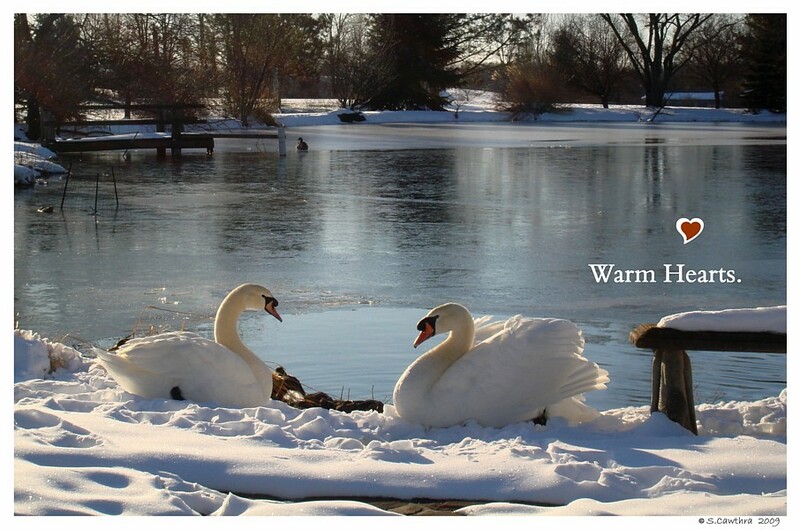 If you Observe your Swans Shivering.. they are trying to keep Warm. 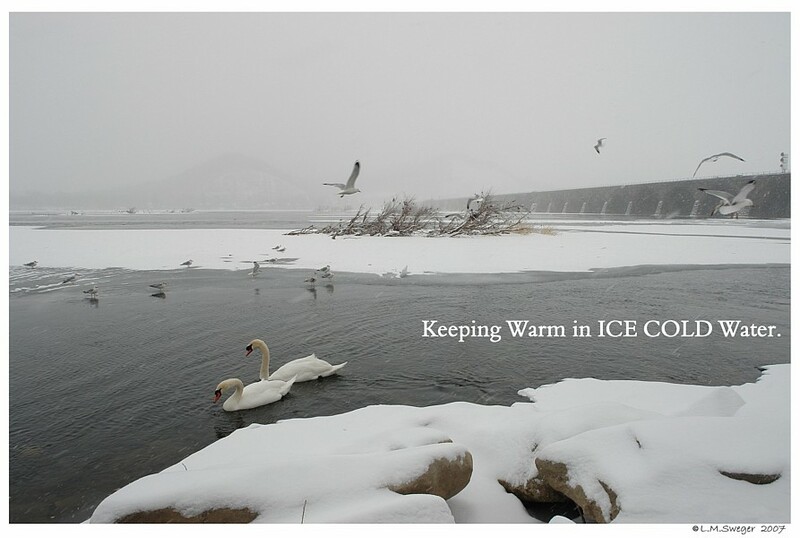 Swans that are handling the Cold will not Shiver much. WATCH Them. If Shivering Continues, then it is recommended to take them Inside for a While. This is a Judgement Call.. Let them Rest in a Shelter..
OR Put some Straw down in a Sunny Area, so they can Snuggle Down off the Cold Ground. This is not much help if it Rains or Snows..
Generally a Healthy Weight = A Nice Full Knob. 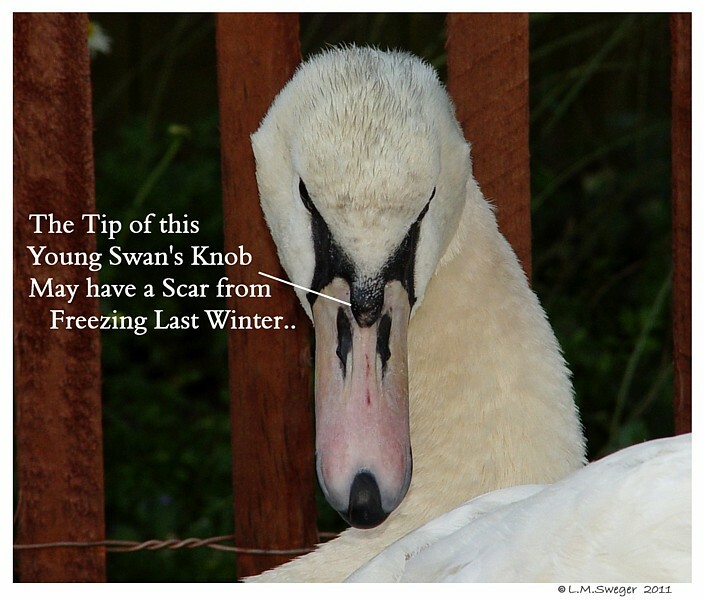 The Knob of Healthy Mute Swans will ENLARGE during the Winter Months. 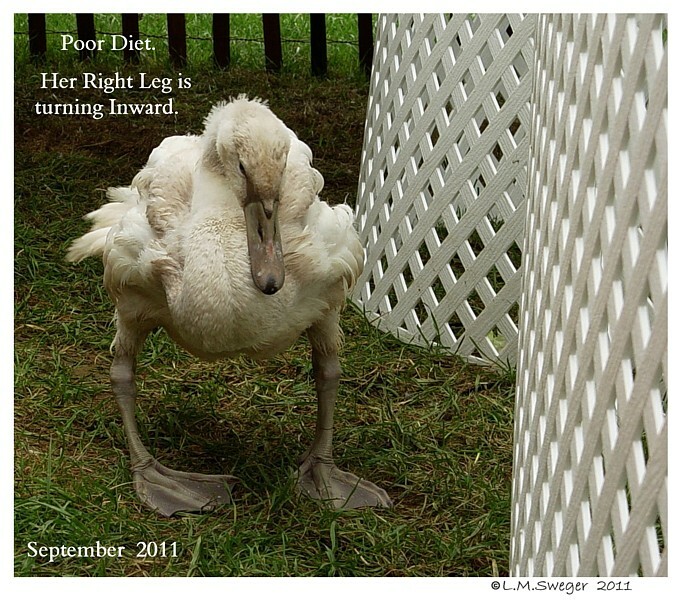 If you notice a Knob shrinking, the Swan may be losing Weight. Taking them Inside would give you a chance to check their Weight. Gently Feel them across their Breast Area. The Keel Bone should NOT be Prominent. There should be a Rounding of the Pectorals – Breast Muscles on both Sides of the Keel Bone. 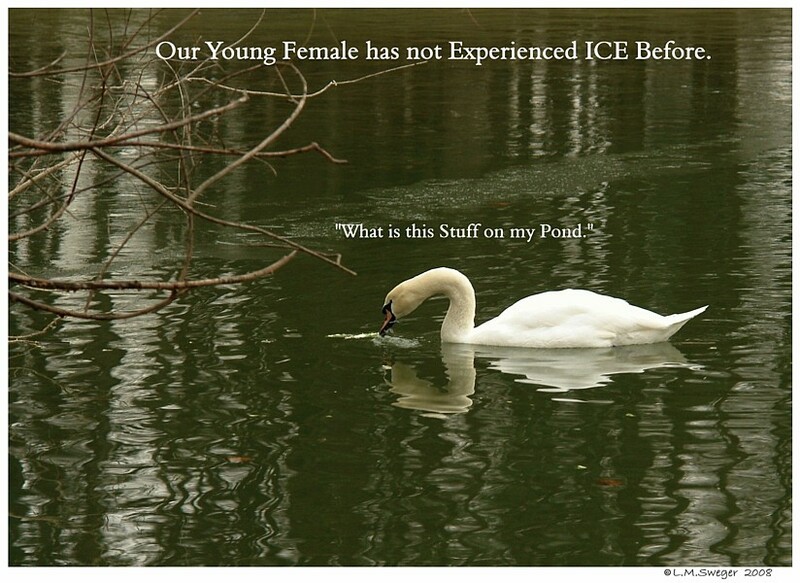 First Year Swan Cygnets NEED to Learn about ICE.. 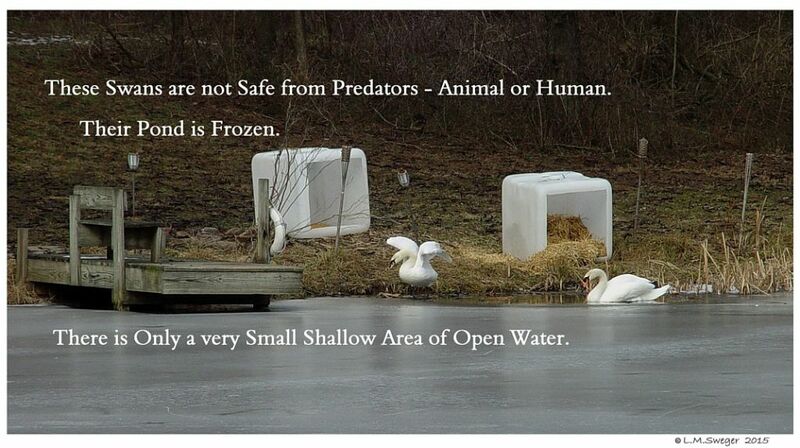 They are NOT Safe Frozen Out of their Pond Water.. 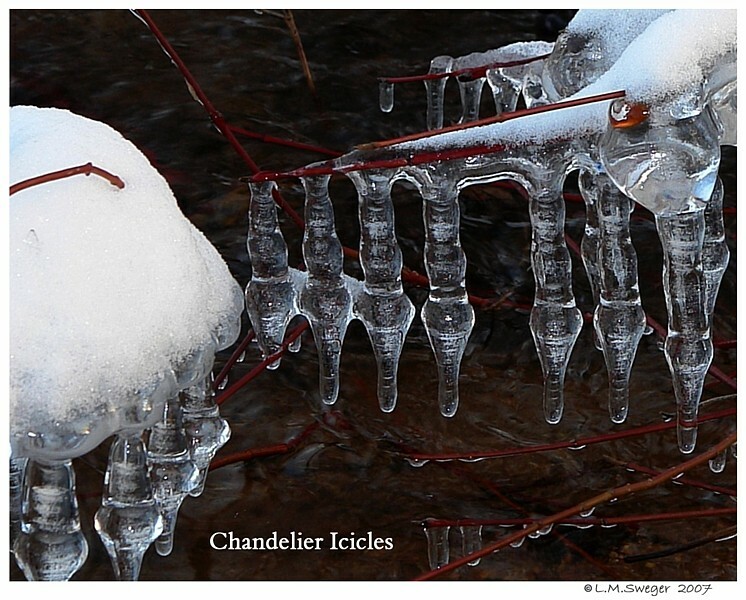 They May Freeze and are Vulnerable to Predators. 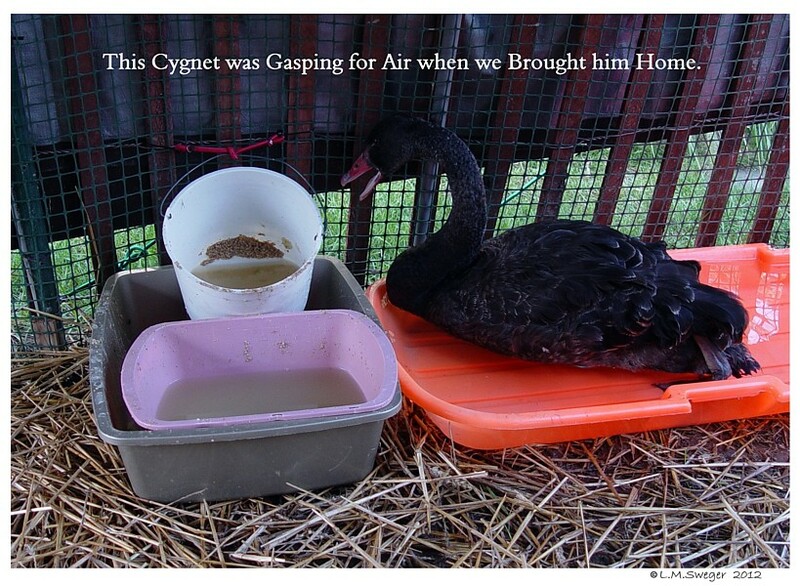 Try to move Cygnets to their New Homes in the Fall..
Captive Cygnets do not have their Parents to Teach them about Winter. 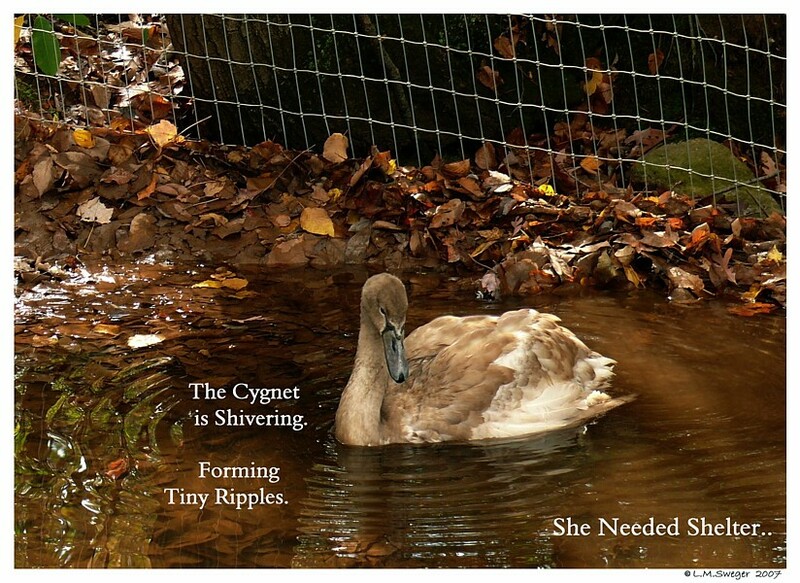 Cygnets need to learn where it is safe to spend their time during the Winter Months. 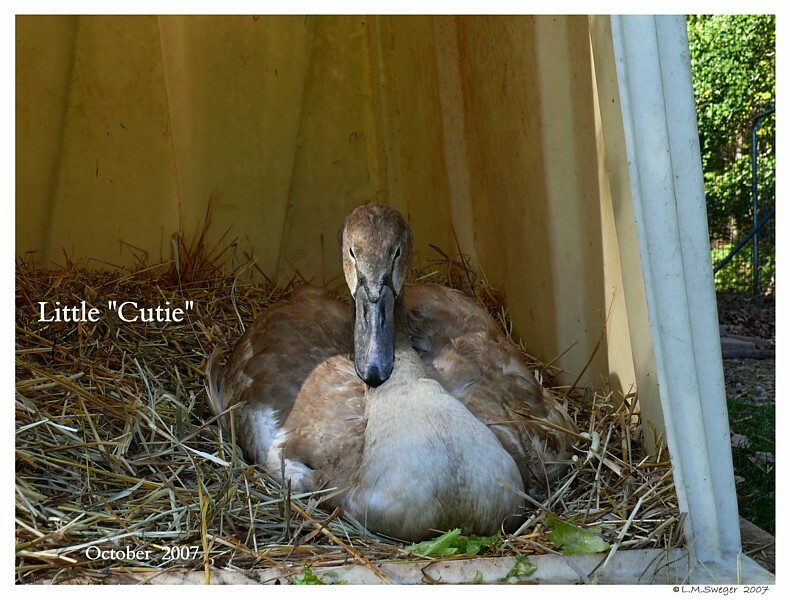 Getting Healthy Cygnets through their First Winter and seeing them OK in the Spring… will be a time of Learning for both of you. In Future Years, when they are more Mature and they will be ready to deal with the Cold and Ice. 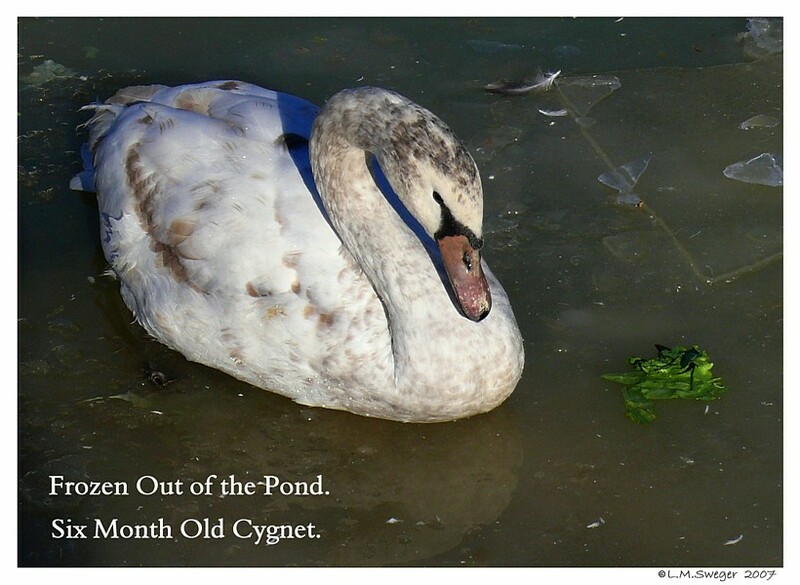 In Late November, December, January, February and March Young Cygnets are experiencing their First Winter. 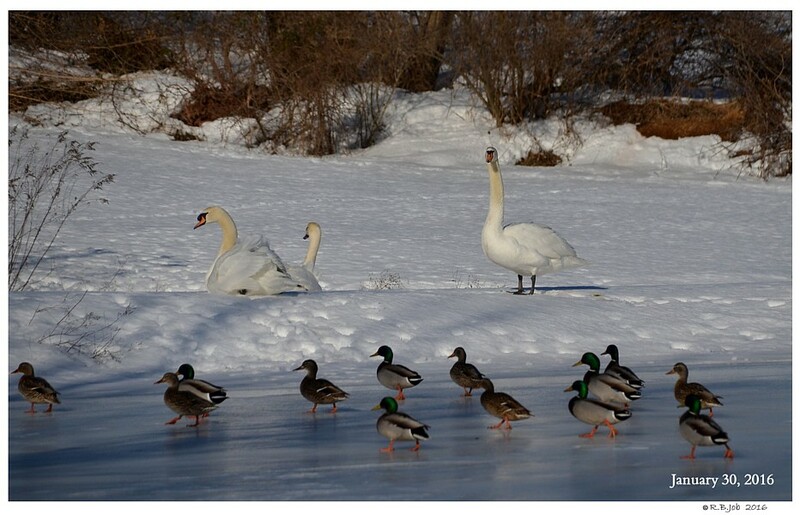 They are Safest in an area of the Pond with Water at least 4 Feet Deep.. The Depth is more important then the Diameter of the Opening in any Ice. 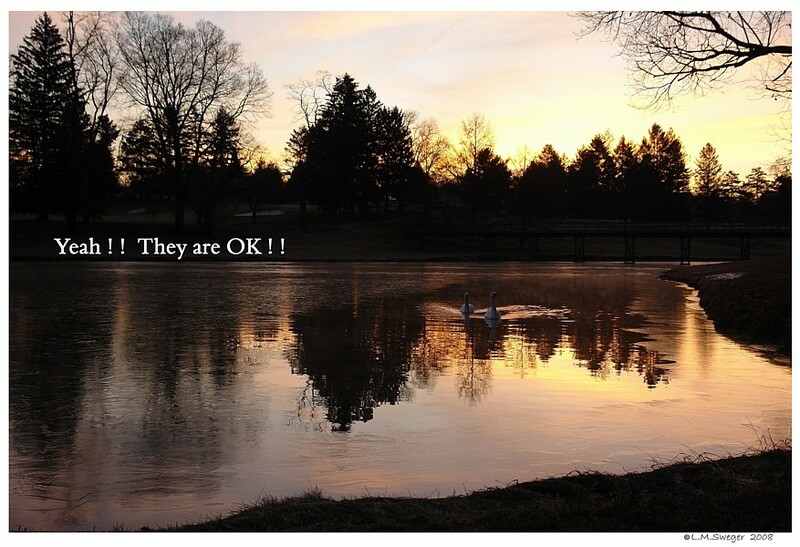 ** You DO NOT Want Predators to Reach the Swans. Generally, the Lower your DeIcing Equipment the Larger the Opening. 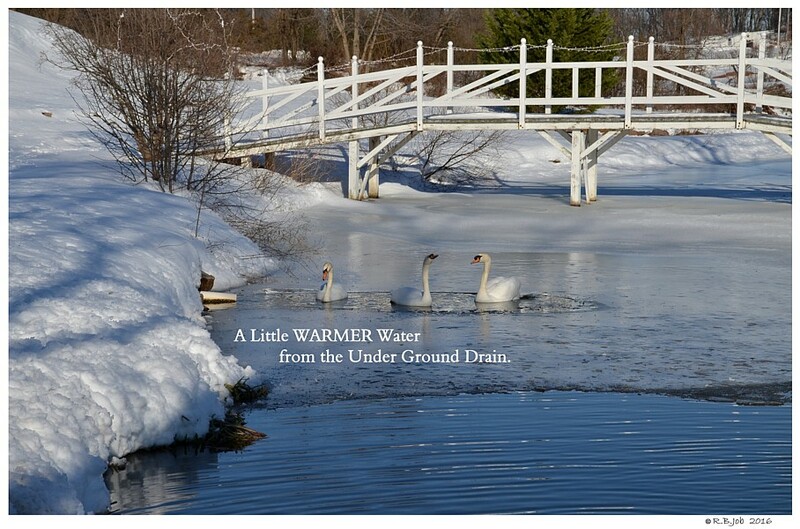 Swans will try to find the Warmest Water in their Pond, even a degree or two Warmer. 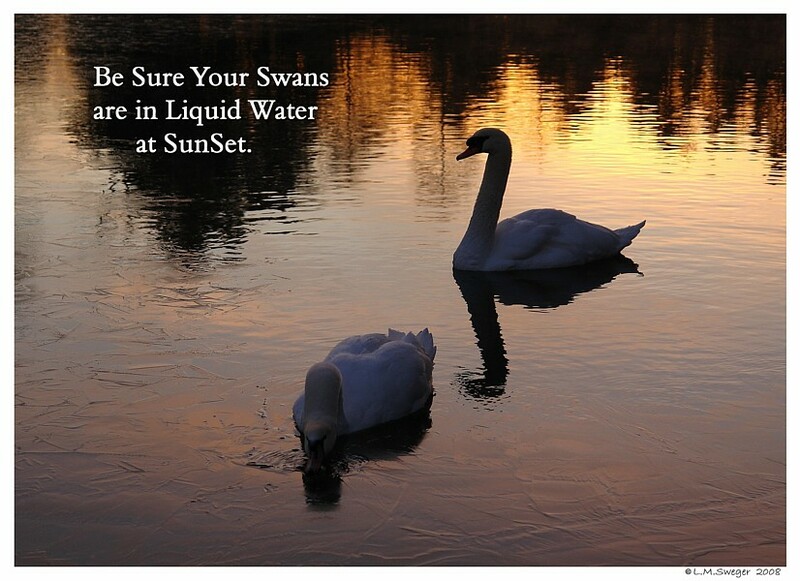 ***** Check at SunSet that Cygnets are IN Liquid Water. to the Ice. **It Happens ! ! 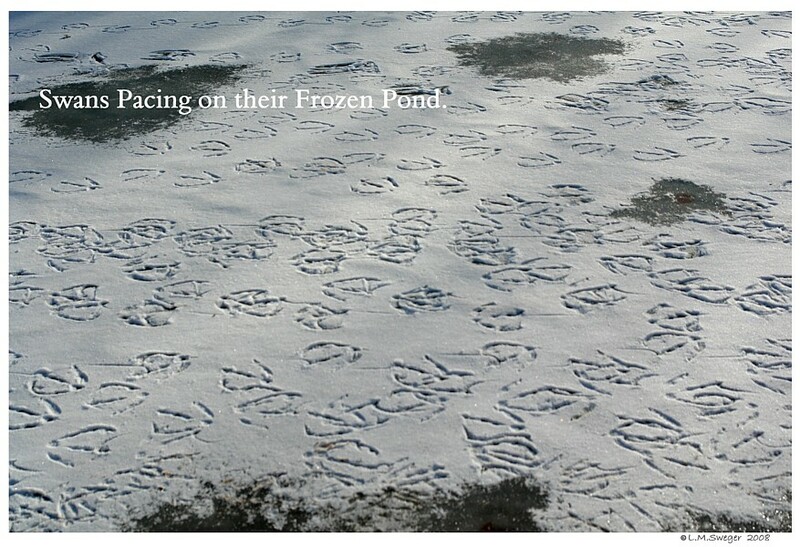 Have a Plan so you are Ready to Help any “Feathered Friend” Stuck in the Ice. will need MANY more Calories.. Increase their Feed Mixture Quantity when it is time for Total Winter Support..
A Healthy Diet their First Two Years will Benefit their Future. 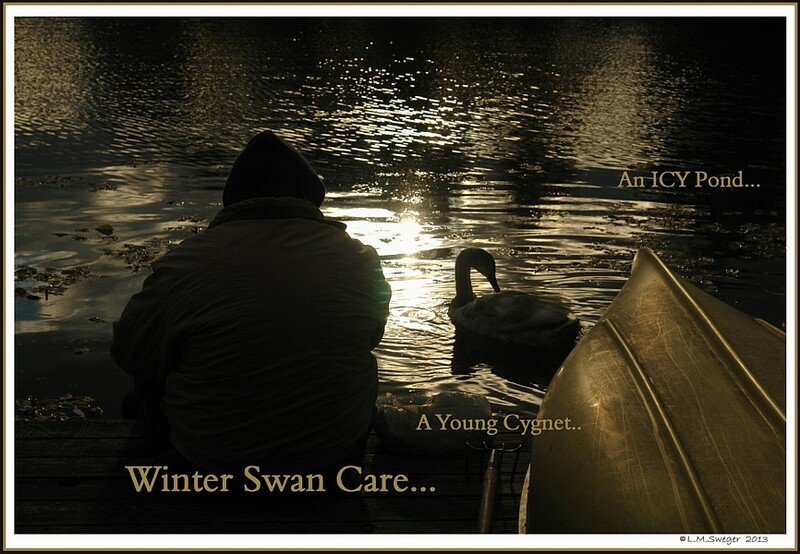 If Your Cygnets are LESS then 20 Pounds.. Keep a VERY Close Watch as Days gets Cooler and Colder going into Winter. They are Still Growing. Harsh Weather will BURN too much Energy. Outside on NICE Winter Days they will Bask in the SunShine. 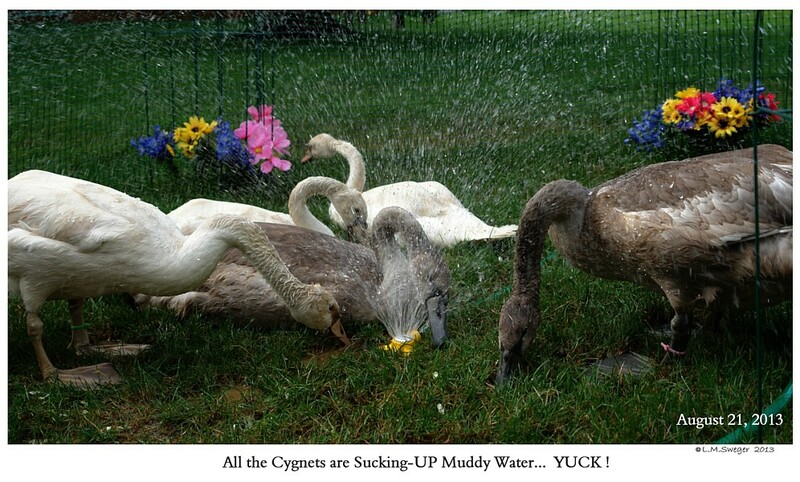 Cygnets 20 Pounds Plus, Healthy and WELL Fed do OK in OPEN Water. I have Worried over the Years, FEARED I might be Wrong, misjudging their Natural ability to Deal with Freezing Landscapes.. and been able to SIGH with LOUD Relief each Winter Morning.. learning they are Just Fine. 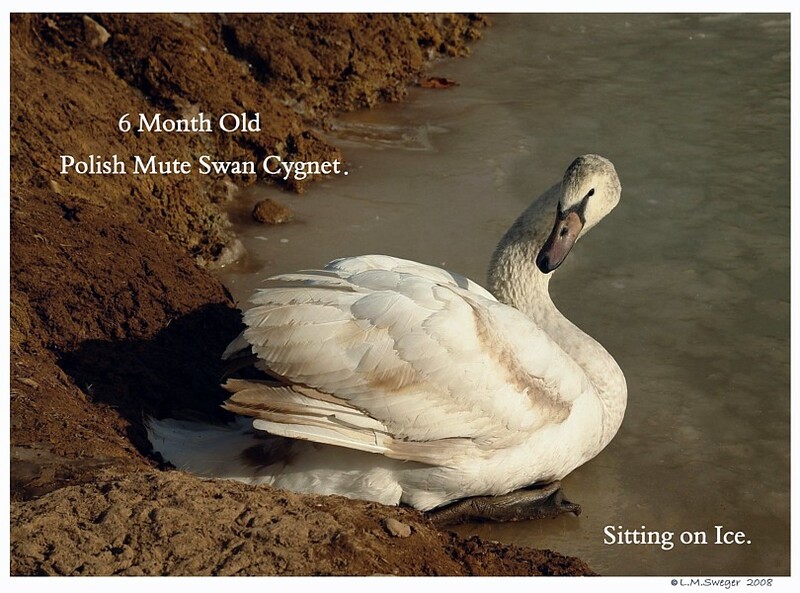 Swans are Amazing Creatures. Nature has Prepared them Well. In the Wild they will Fly to Save themselves – if Possible. In Captivity, they need us to help them Survive. should be Liquid. 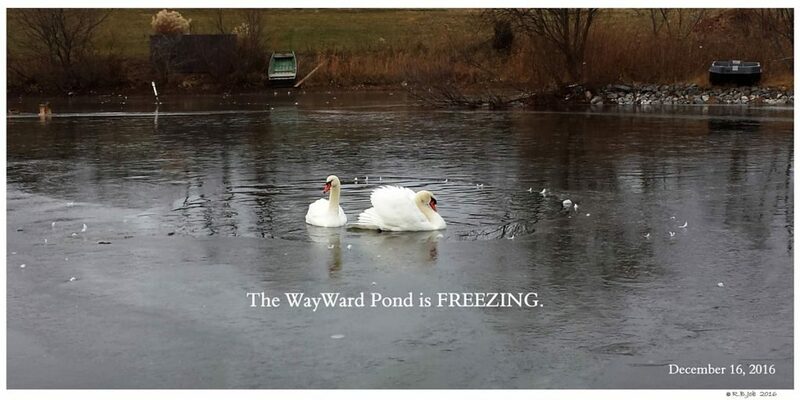 This Hard, Cold, Stuff on their Pond is unfamiliar. 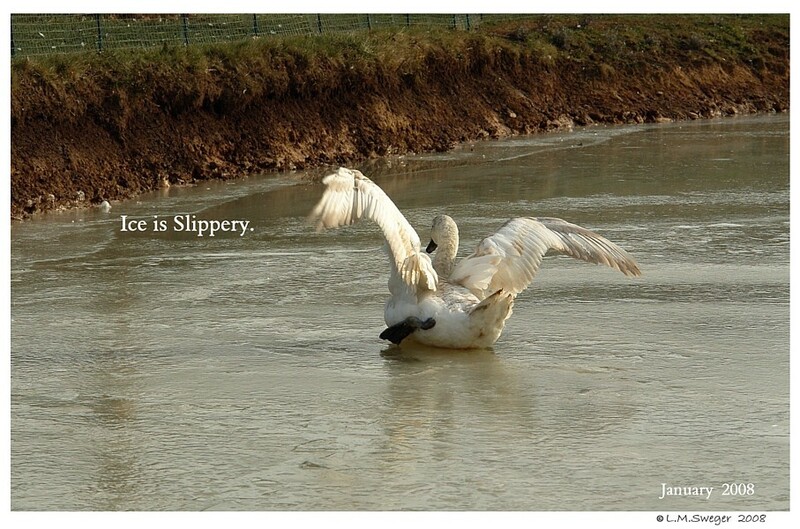 AND it is Slippery.. When they try to Run on the Ice, they Wipe-OUT !! They will Learn. 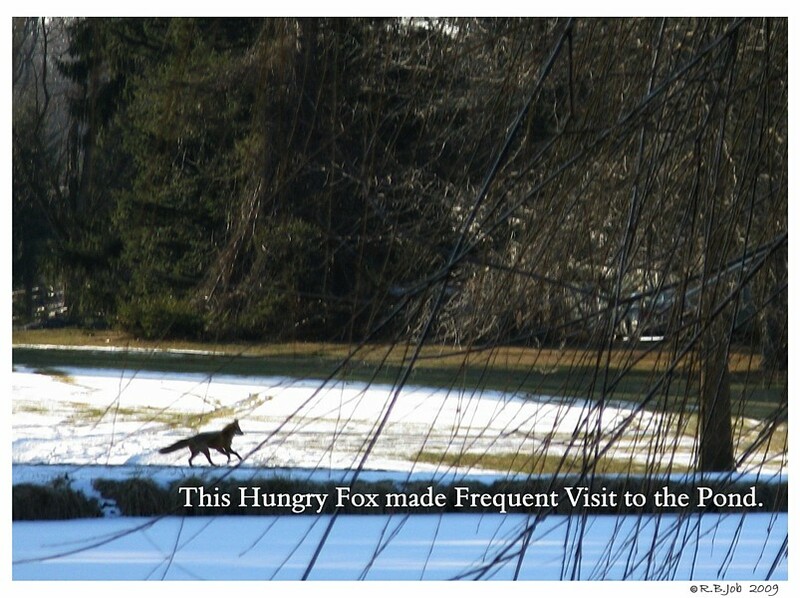 Their Natural “Instincts” may not have Winter in their Programming. Dealing with the Cold, Ice and Snow are part of their Learning Process. Without their Parent.. they need to Learn. 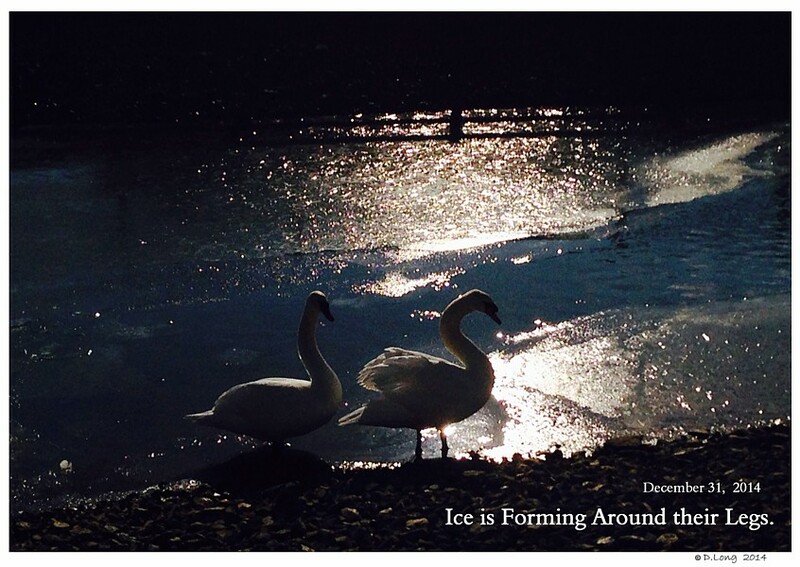 Given the chance Swans will Work-out many Problems..
And they learn from their Experiences and each other. Little “Hannah” was Bewildered by the Ice forming around her. 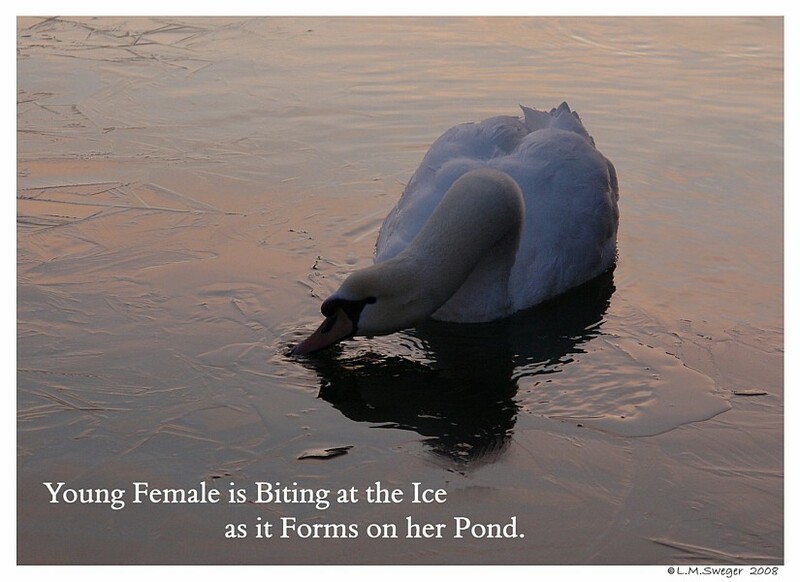 I watched her Bite and Poke at the thin Ice with Annoyance. 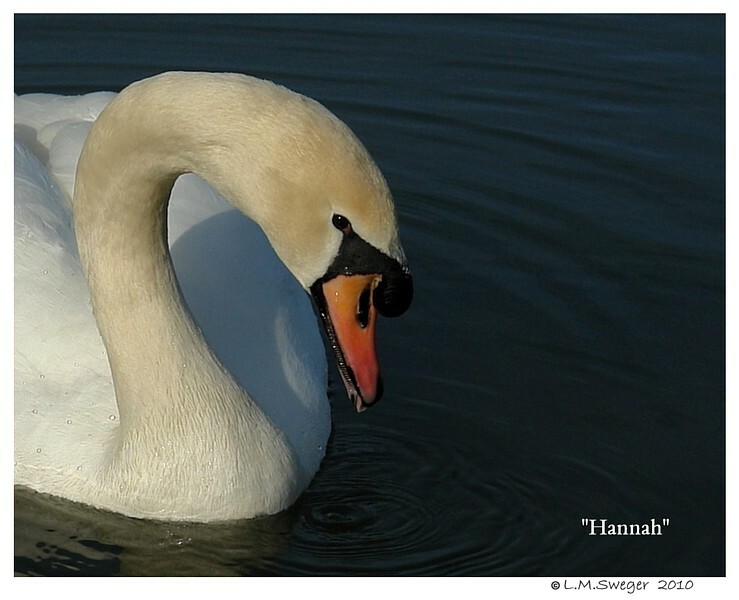 “Hannah” was with an older Male (around 10 Years Old). 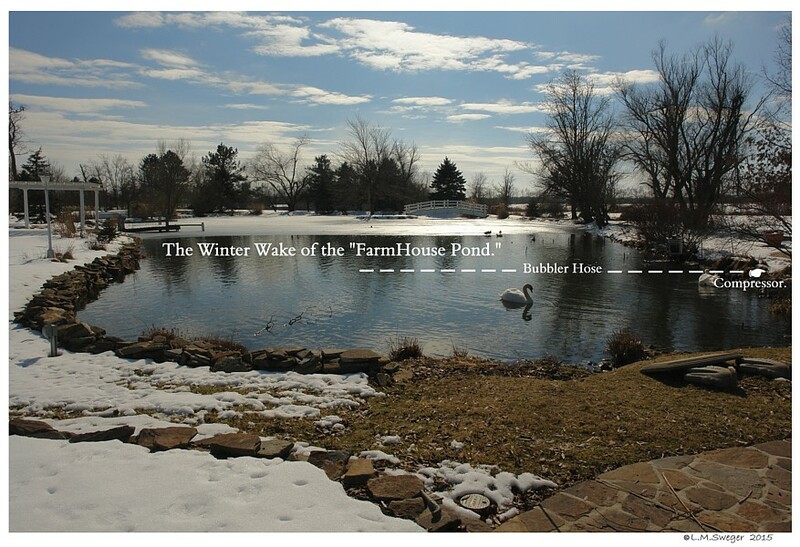 He had been through many Winter Months and knew to keep her in the Open Water areas of their Pond. 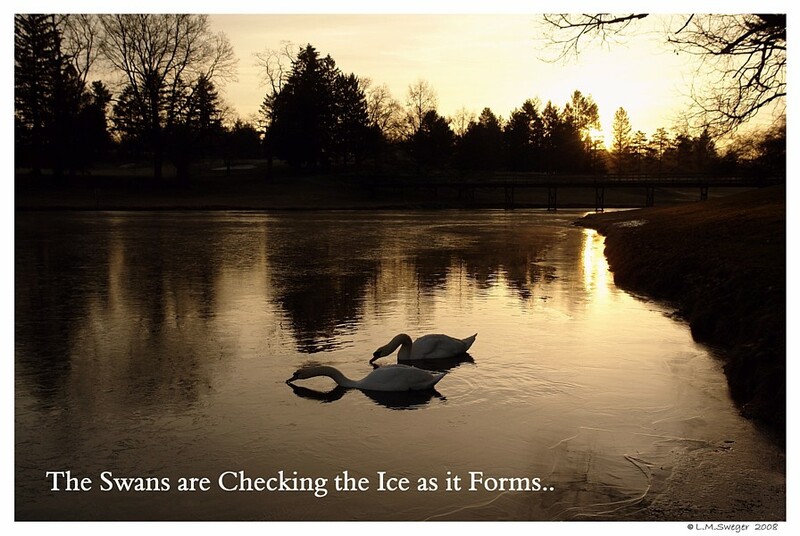 IF you have ANY Doubt about what to DO..
Do what is Safest for the Swans. 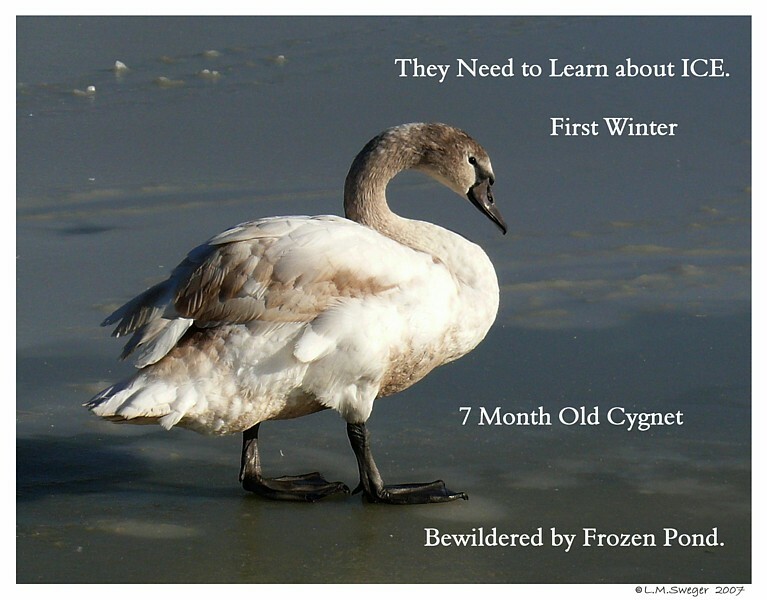 The first Year for New Swan Owners is a Learning Process..
and the first Year for a Swan Cygnet is a Learning Process..
ALL Swans need more Calories during Cold Weather. 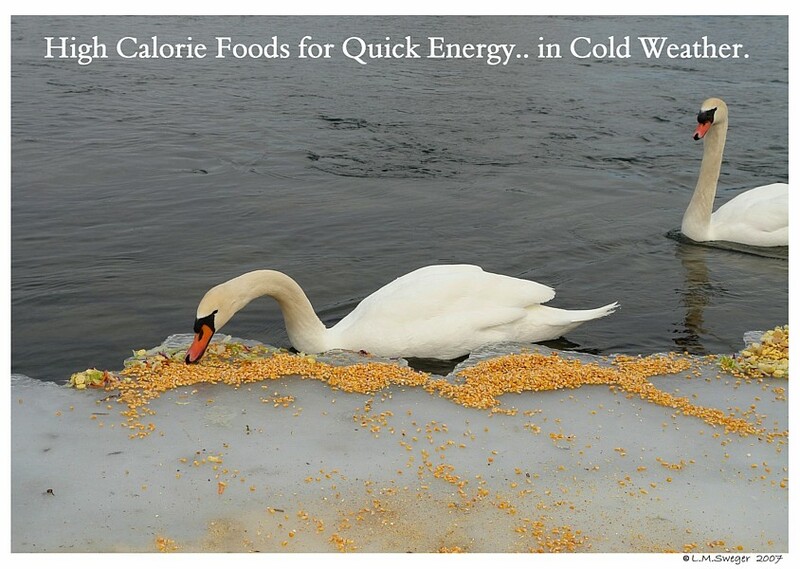 Increase the Feed available so they have extra Calories for Quick Energy to stay Warm. Cereals are Good Treats… Check Ingredient Label. 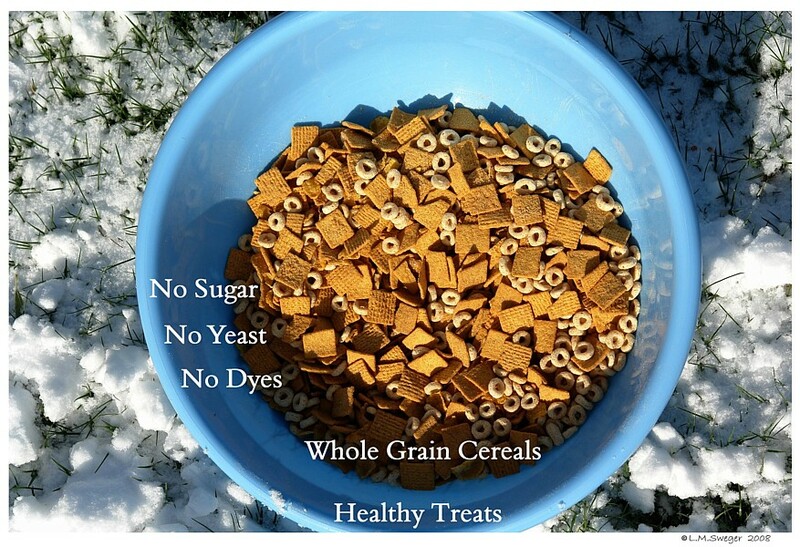 NO Yeast, Little to No Sugar or Salt… No Colors or Dye. Plain Cheerios or Corn Flakes. 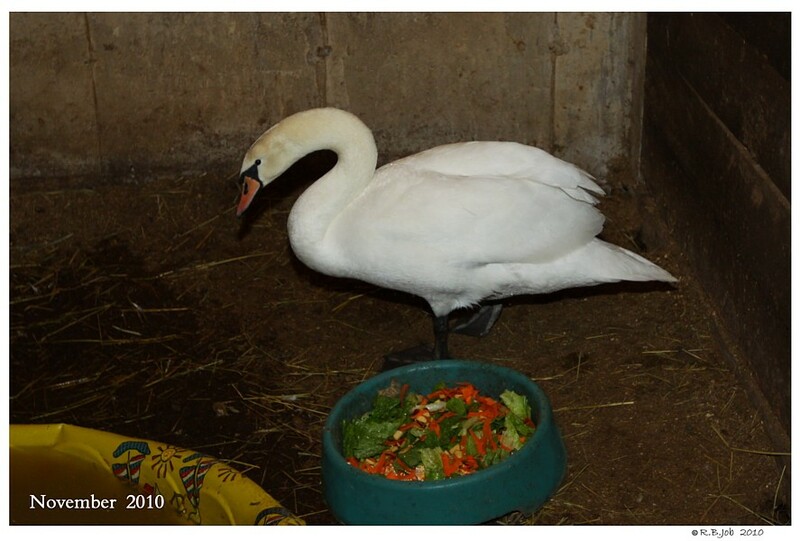 Swans LOVE Bran Flakes and Kix. 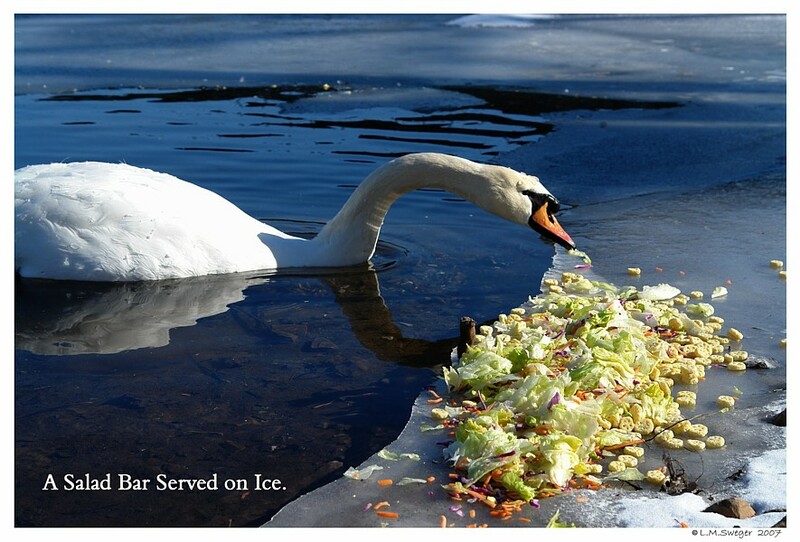 Check their Food, Feed and Vegetables are not Frozen. 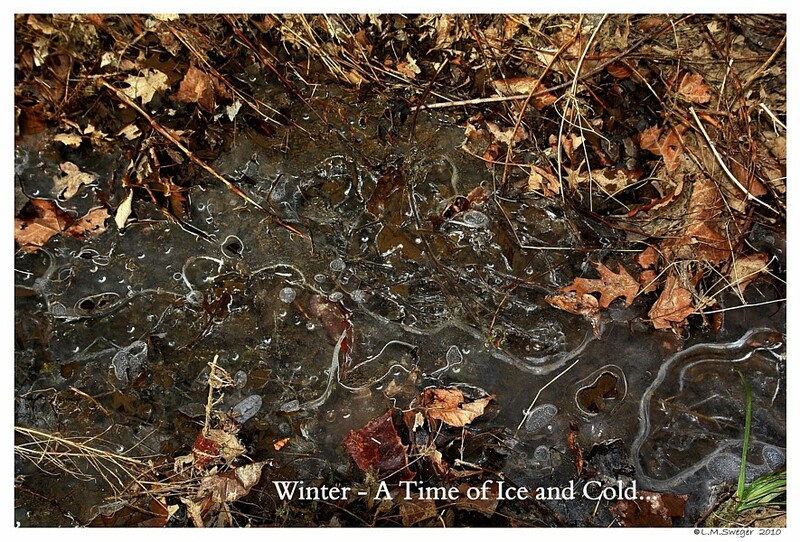 EVERY WINTER is Different – I ENJOY the Milder Ones..
and PREPARE for the Nasty Ones. 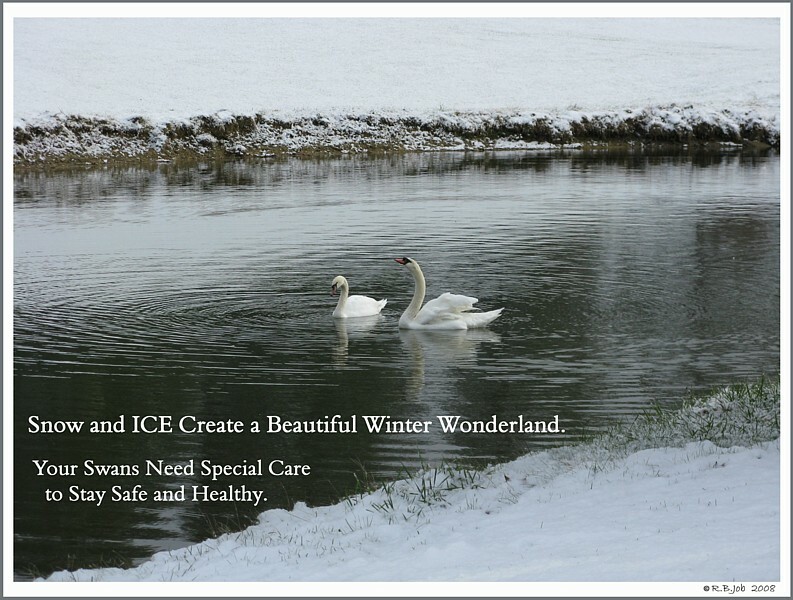 If your Swans are on a Pond with a Vigorous Natural Spring that keeps an Area of Water OPEN during the Coldest Weather..
Having Equipment Ready for DeIcing – It is a Good Idea. We had Licensed Electricians Install ours.. NOT a DIY Project for Me.. I am Adding the Below Information.. FYI ONLY. 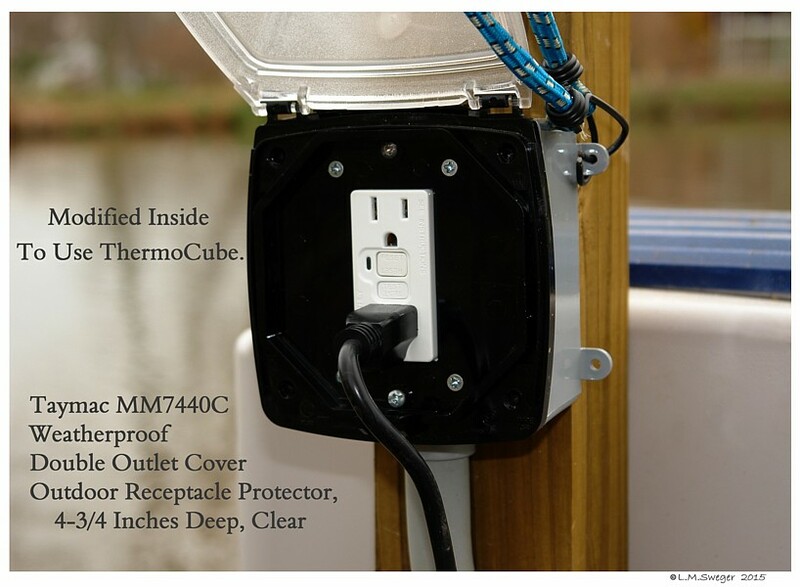 Installing GFCI outlets in all wet or damp locations like kitchens, bathrooms, laundry rooms and basements are a must to meet the National Electrical Code. We HIRED a Licensed Electrician. 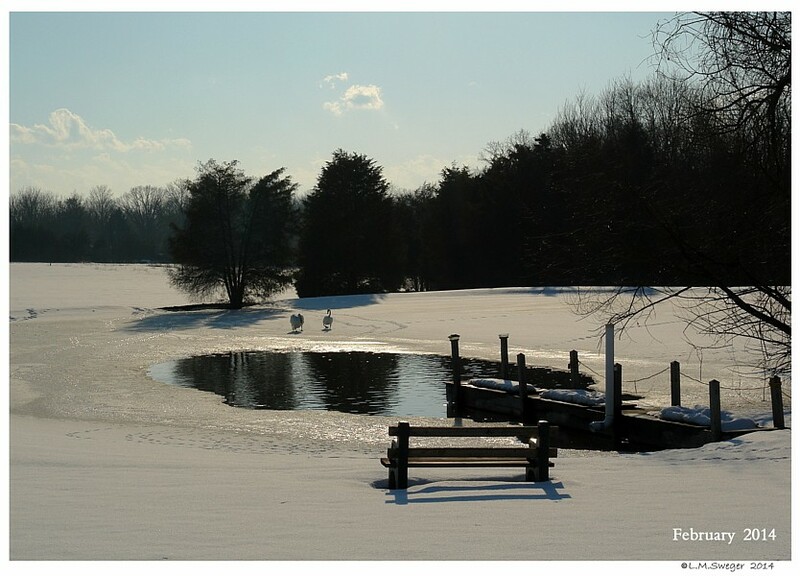 Any DeIcing Equipment “Can” be used all Year Round for Pond Water Aeration which is a GREAT Benefit to most Ponds. Timers are useful for Intermittent On/Off. 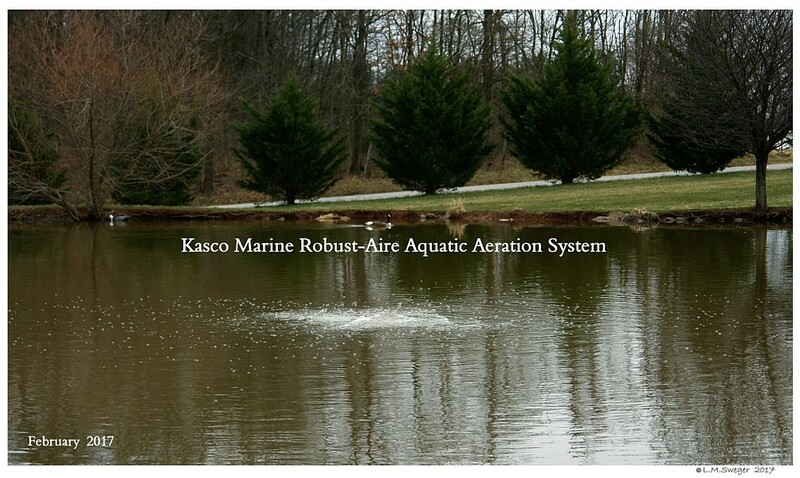 Use as Desired..
Aeration-Circulation helps reduce nuisance Surface Plant Growth due to Organic Decay. 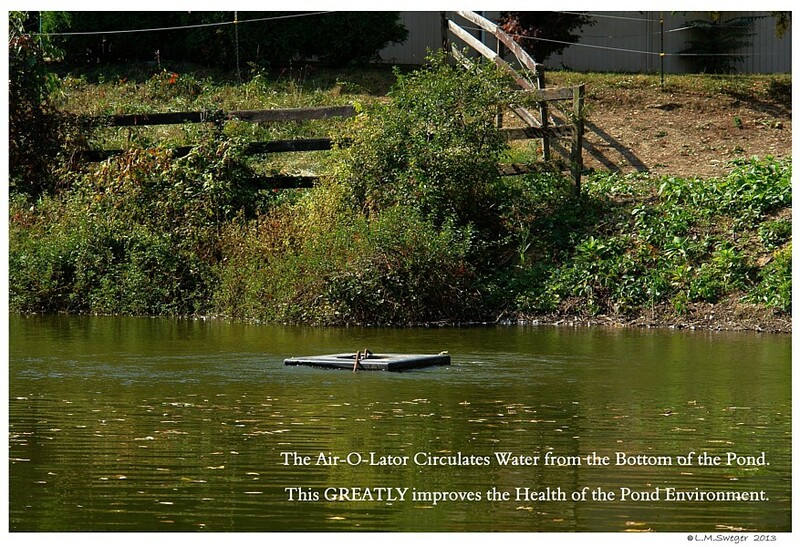 It adds Oxygen to Lower Pond Water. 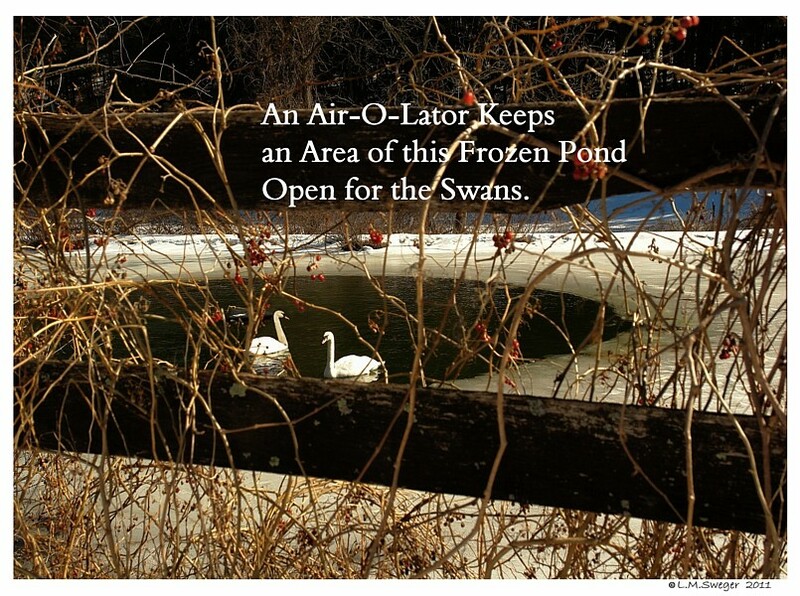 OPEN Area over Water that is at Least 4 Feet Deep helps protect Swans from Predators that may be Stalking them. 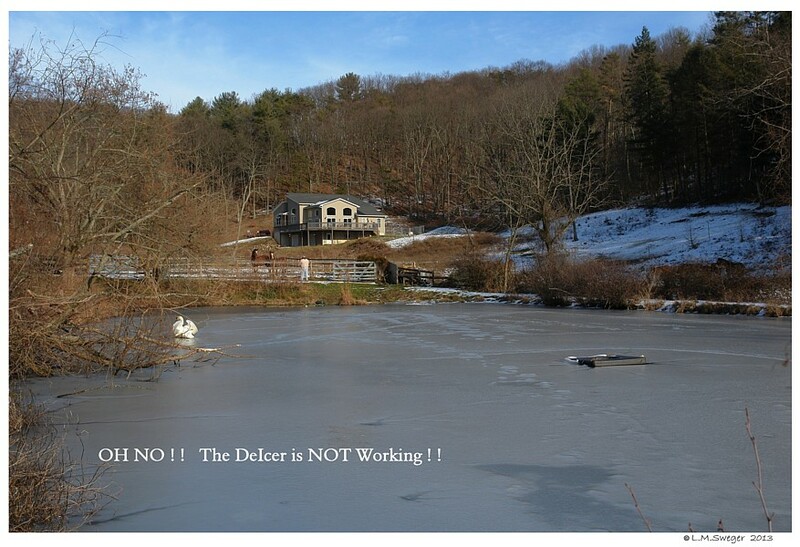 Various Methods of Deicing a Winter Pond are VERY Helpful..
None are appropriate for all Ponds..
YOU DO NOT WANT Equipment that uses HEAT. 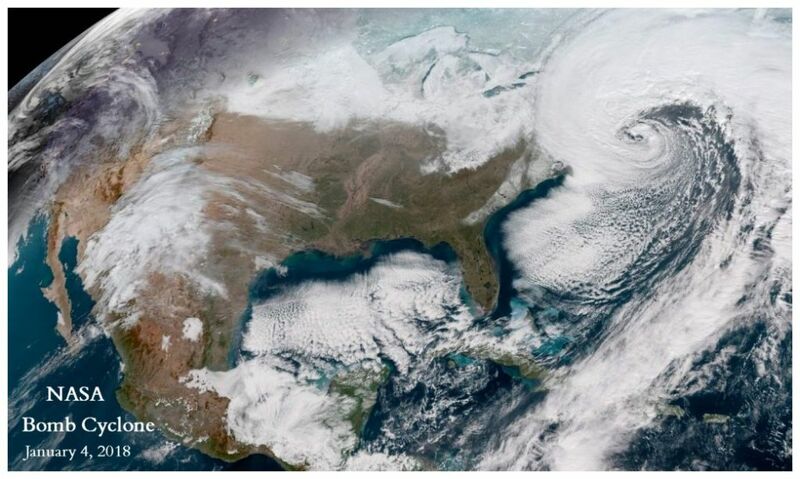 You want Circulation.. Moving and Mixing Water. 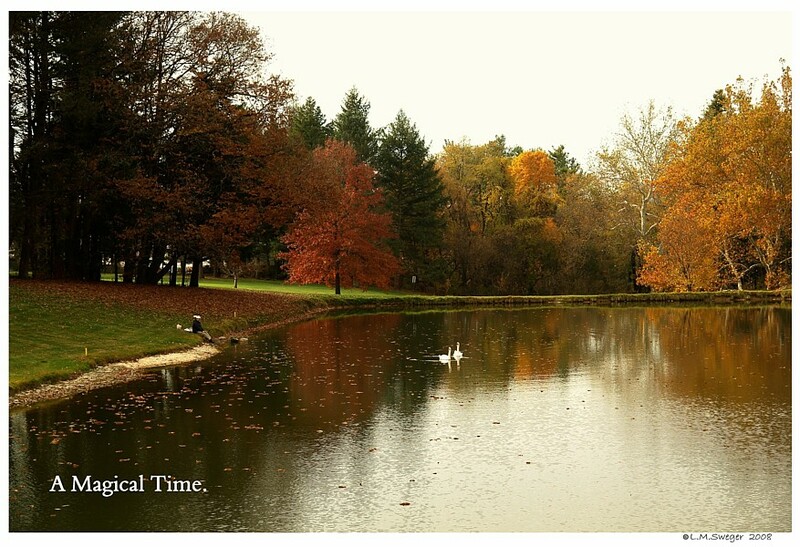 There are 4 Basic Types.. Every Pond Situation is Different. These ALL Require having Electric Service Available. 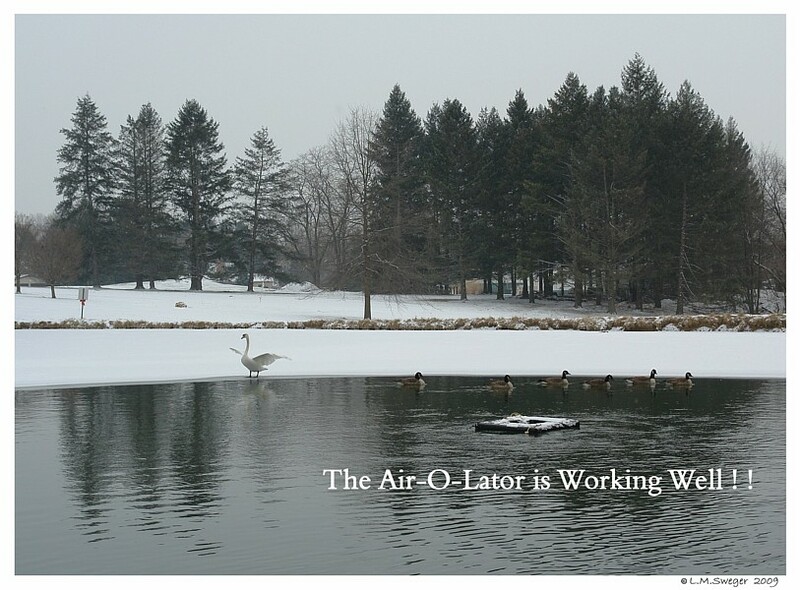 Air-O-Lator – Aerators.. Electric Cable in the Water. Bubble Diffusers.. Compressor and Weighted Hose in the Water. We had this System Installed 2016 Runs 24/7 No Problems. Bubble Hose.. Compressor and Weighted Hose in the Water. 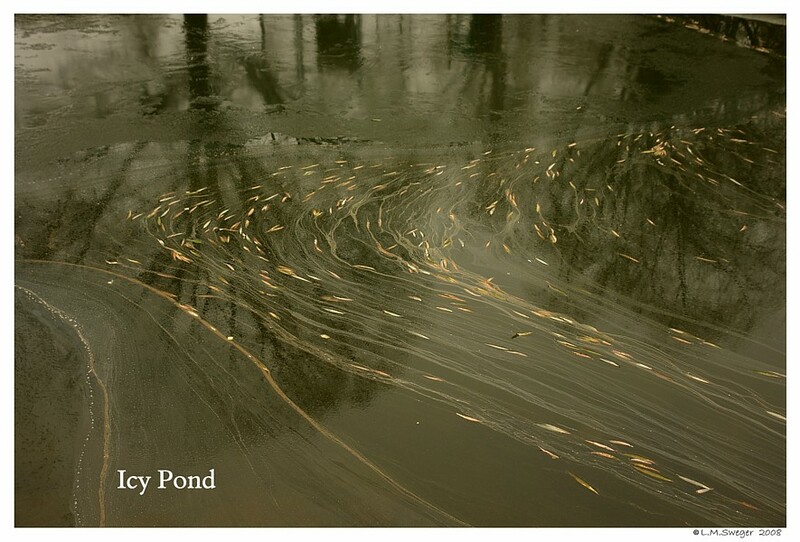 IF THERE is Electric available by the Pond. Threading Electric Cable through PVC Conduit is Added Safety. A Submersible Pumps.. Electric Cable in the Water. A Submersible Pump in a Large Bottom Bucket is an Inexpensive “Just in Case” way to keep Pond Water Open..
Sump Pumps.. Some Folks use these.. Electric Cable in Water. NOTE” Winter 2017-2018, As I think back I am Aware.. The Pumps that Draw Water in and Discharge have a VERY Common Problem. Toward the Unit.. Clogging them. If your Pond has a lot of Debris.. these are a Pain.. 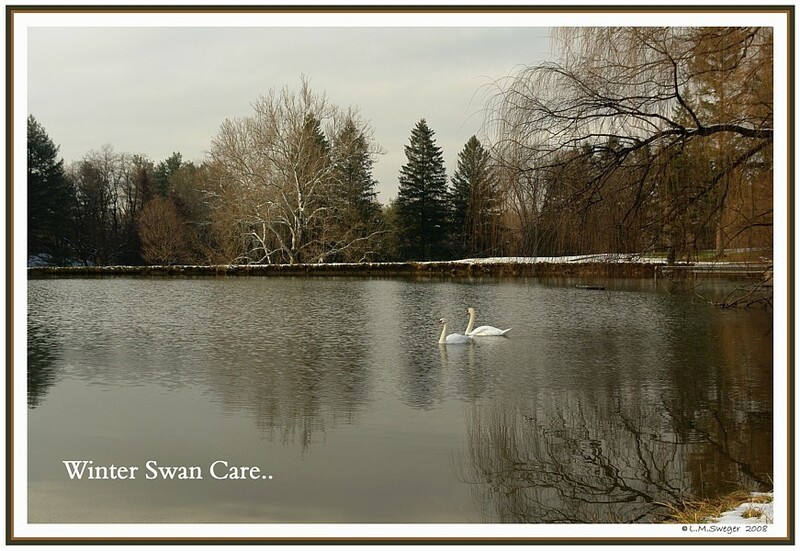 If your Pond is Fairly Clean.. then these are Workable. Another Hazard.. to be aware of.. 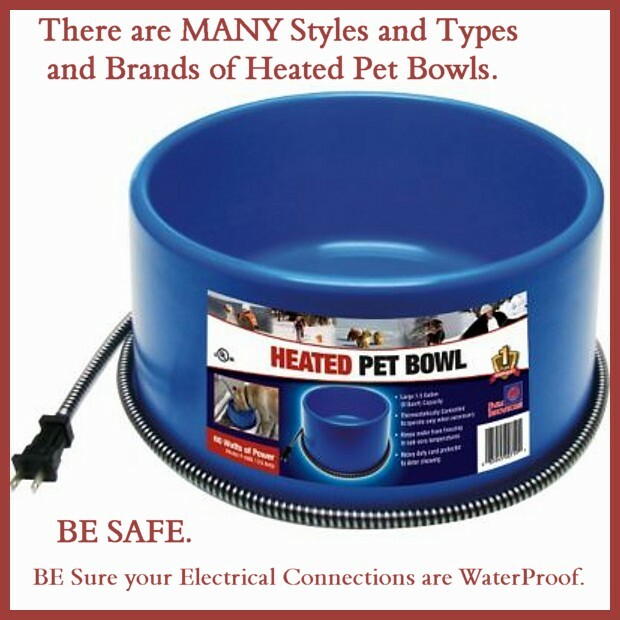 This Could Result in Electric Shock Drowning, Potentially Electrocuting a Person touching the Water. Leading to Temporary Paralysis and the Inability to Move. This Could Electrocute your Waterfowl..
One Pond we Visit was having Problems keeping their Aerator Unit Running. The GFCI would Trip-OFF after their Unit had Run for a while. Not sure if Dampness was the Problem.. ??? Over and Over the Unit would Turn-OFF after running for various periods of Time. The Electric Cable was Checked several times. Frustration – Undependable. 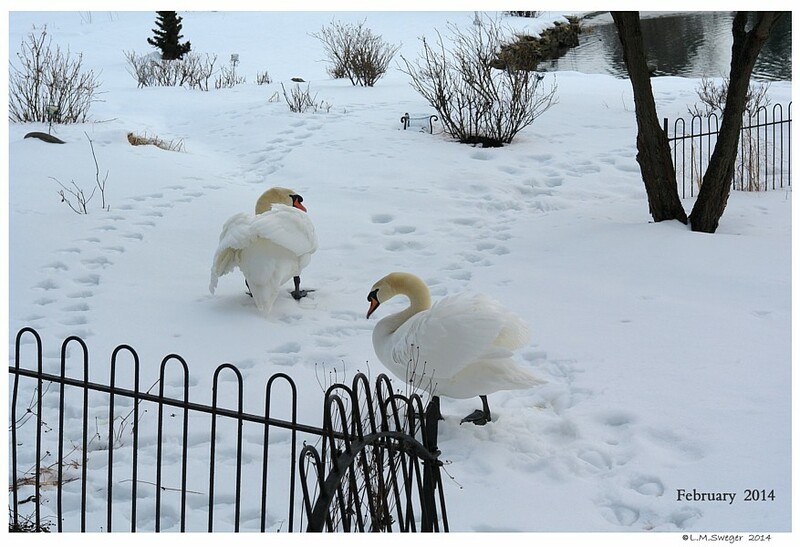 Fortunately, the Owner did notice there were times All Swans and Ducks would not get in the Water.. and other times All would be in.. Concern there was Electric Current in the Water, they changed their DeIcing to a Compressor – Hose System.. 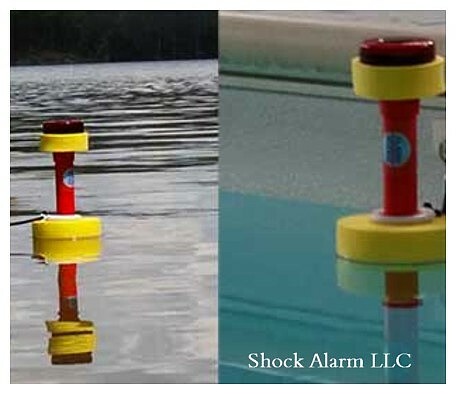 There are Products used as Indicators of Electric Current in the Pools, Ponds and Lakes. 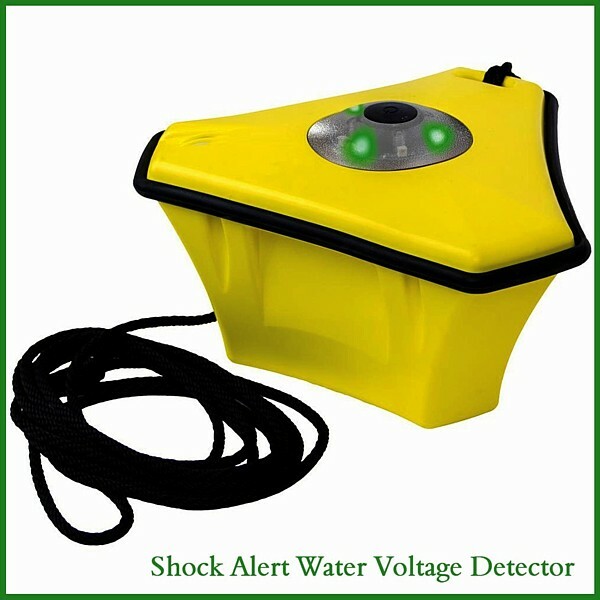 Be CAREFUL you are Looking at Units for ELECTRIC CURRENT DETECTION. An Interenet Search found Several. 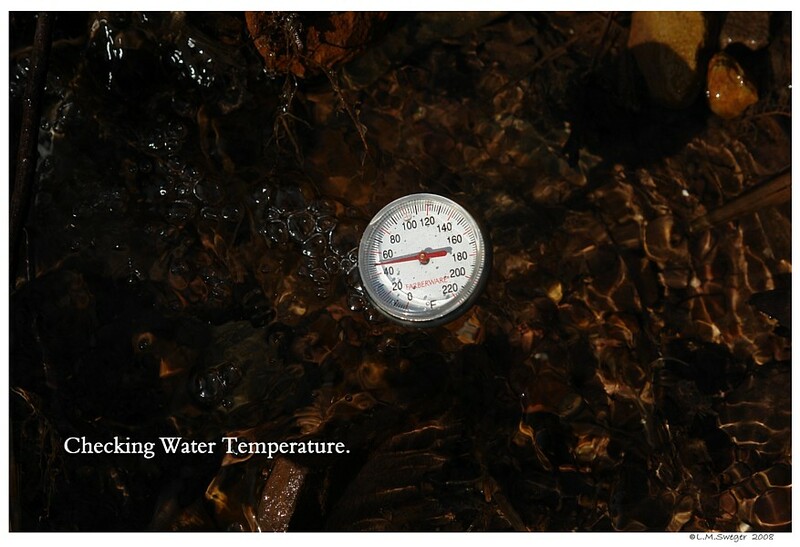 Reading the Product information and Customer Reviews would be helpful in Selecting the Best for your Water Environment. We have not used these..
NO Electric Cable in the Pond. I did Consider this Product.. it is Sealed.. IN OUR TRAVELs and EXPERIENCEs. There are SO Many Types of DeIcing Systems now.. 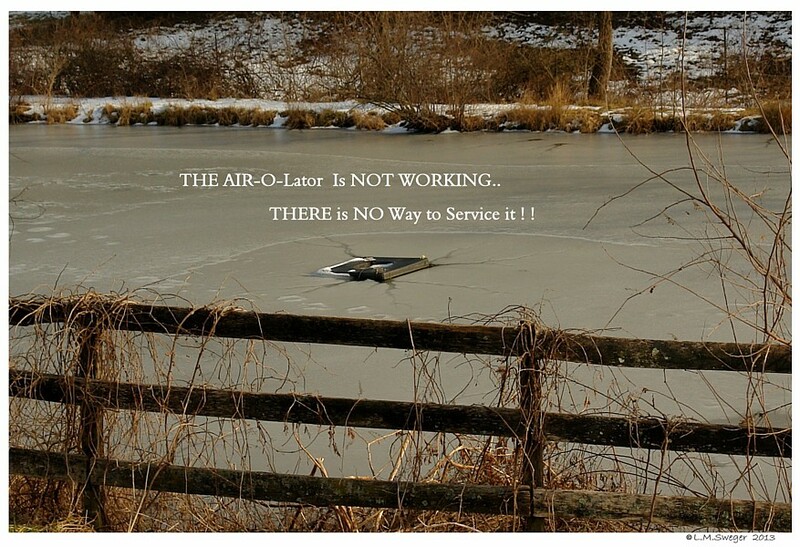 If you consider installing an Air-O-ator or other Aerators with a Motorize Circulating Fan.. 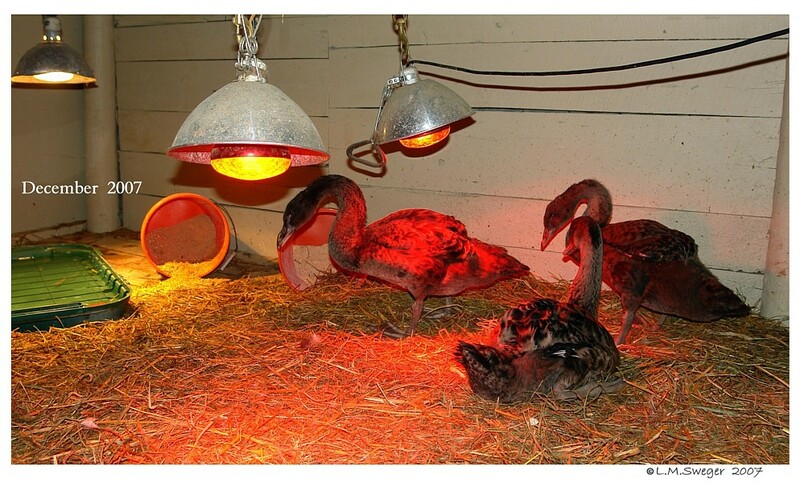 Ask the Sales People about a Grill over the Fan/Propeller..
Let them know you have Swans with LONG Necks.. The Propellers are Turning at a High Rate of Speed.. They could Easily Cut Beaks, Heads or Necks. I have NO Experience.. but, they look Risky. 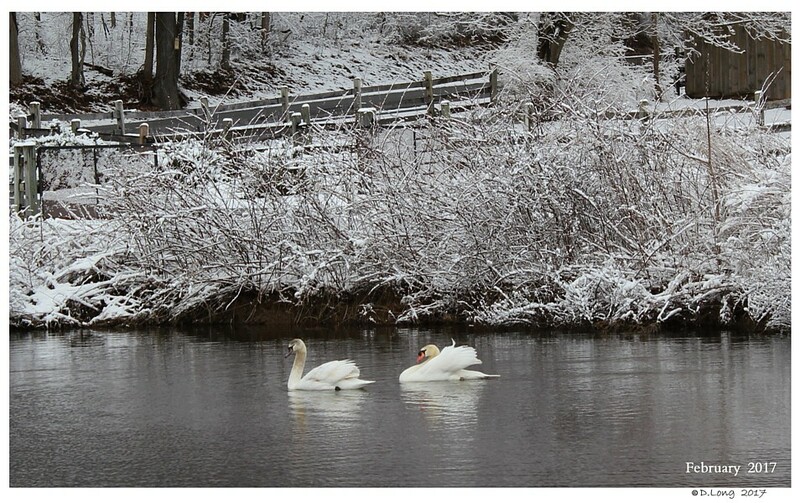 Swans are Nosey.. they like to put their Faces in the Fast Water Current. 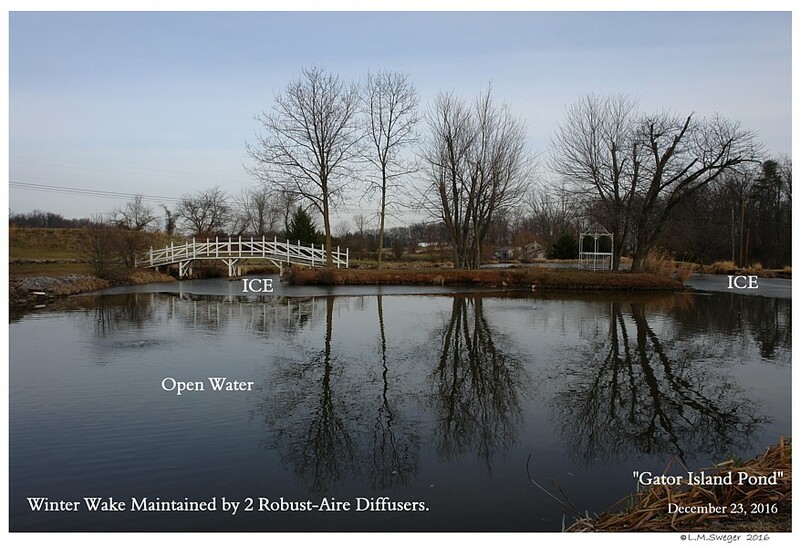 We Used the Air-O-Lators on two different Ponds. Motor-Propeller Unit Suspended down 5 to 8 Feet. 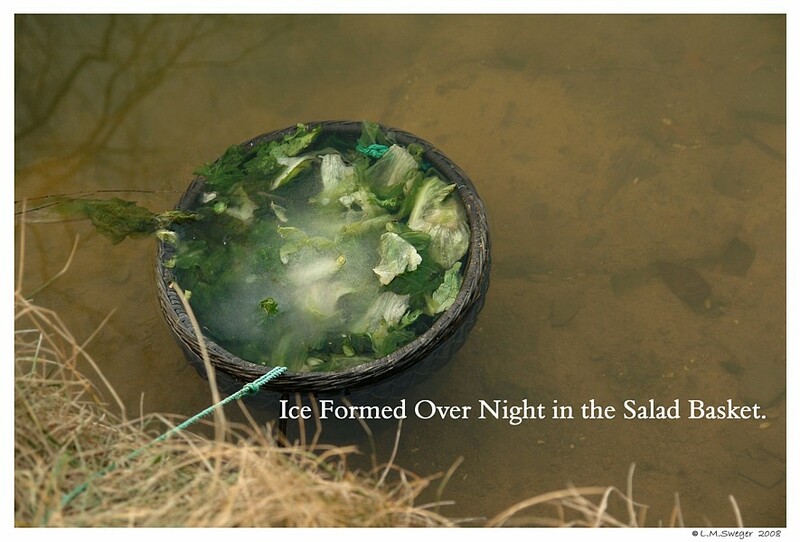 Worked Great in the Summer to Circulation the Pond Water.. But, two out of three Winters they Quit when we NEEDed them Most. 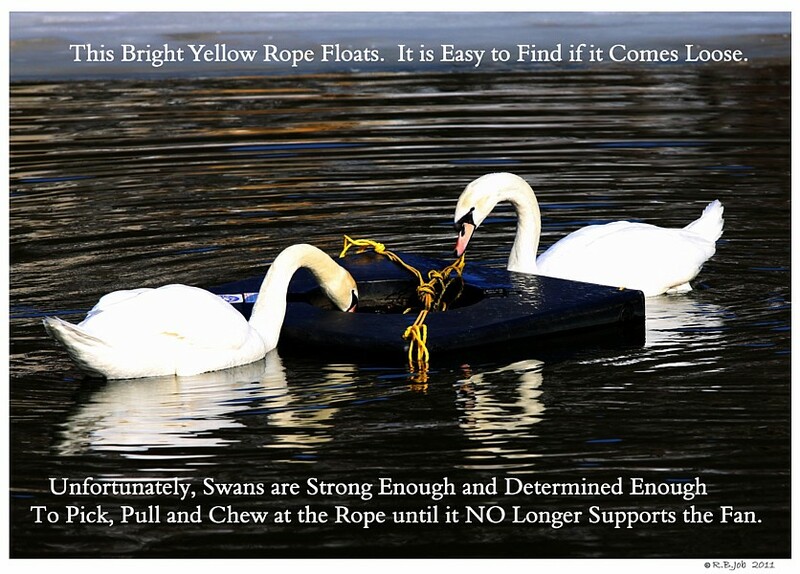 One Year our Swans Chewed and Pulled at the Ropes securing the Floatation until it came apart and Twisted to a STOP. The Water FROZE and there was No way to get to it. Earlier that Winter a Plastic Bag became TANGLED in the Propeller and had to be Removed.. for it to Resume Spinning. The Second Pond.. in October the Air-O-Lator was working Perfectly. 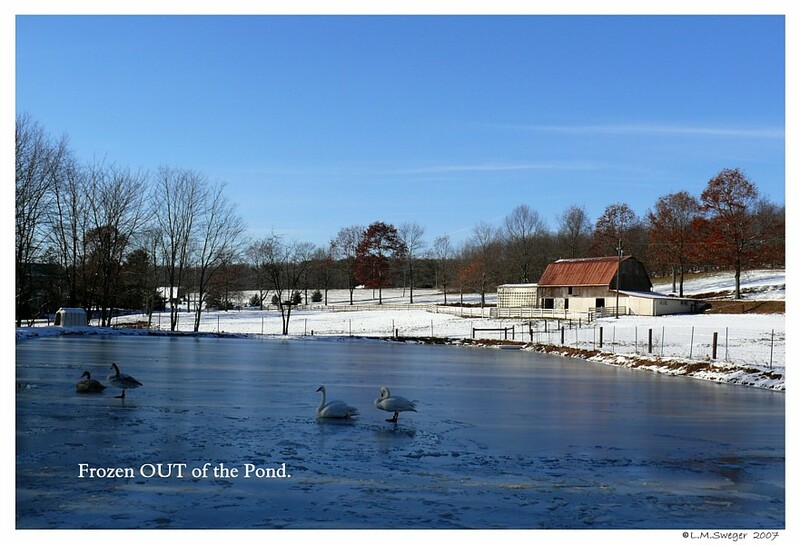 Mid-December it STOPPED – the Pond FROZE Again. There was NO Safe way to Service the Unit..
We WORRIED Every Day and Night until Spring. 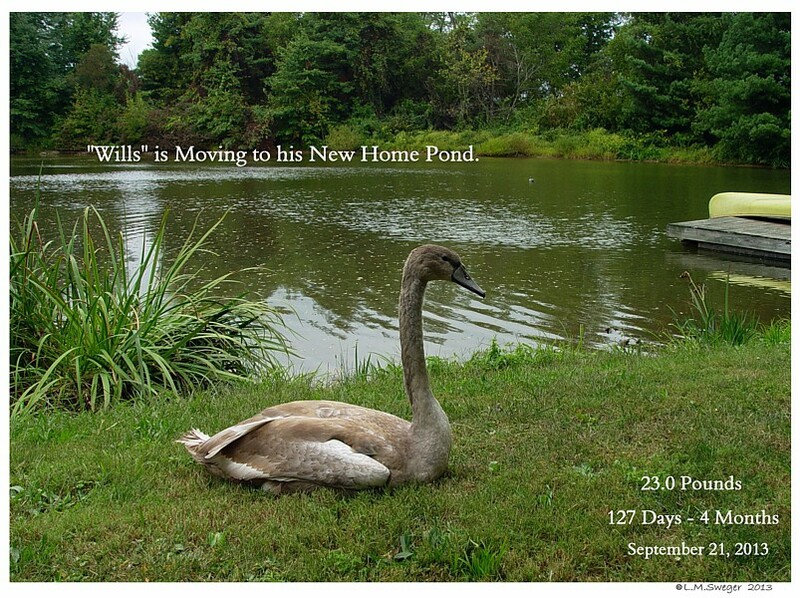 A Farm in Lancaster Co. lost a Swan this Summer.. The very low water level during the LONG Dry Spell allowed the Aerator Support Ropes to become limp-loose..
One of their Females got her Neck tangled in one of the Ropes and basically hung herself. 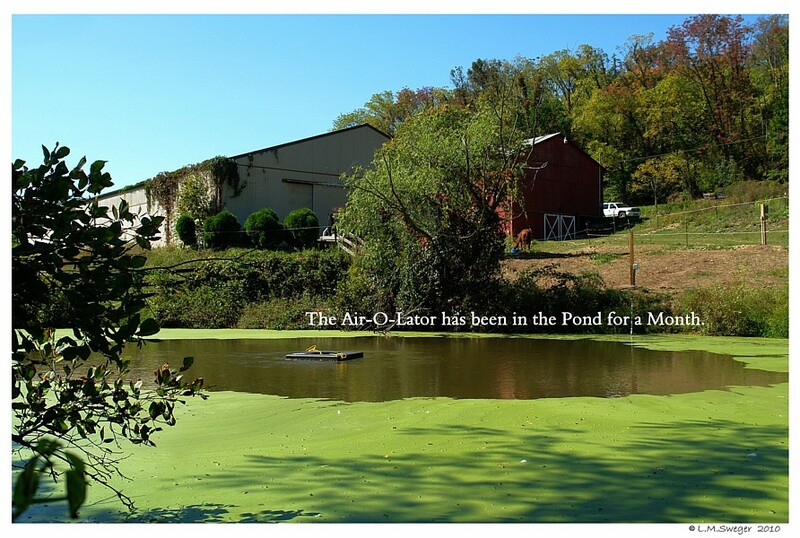 The Farm has had their Aerator System for many, many years.. But, with this Summer’s lack of Rain their Pond was the lowest it had ever been.. Any Loose Ropes are a Tangle Hazard. In 2016, we were making Winter Plans. I was TIRED of all the Problems of the Aerator Types and the Submersible Pump needed Frequent Cleaning in that Pond. NO Fun in COLD Weather. 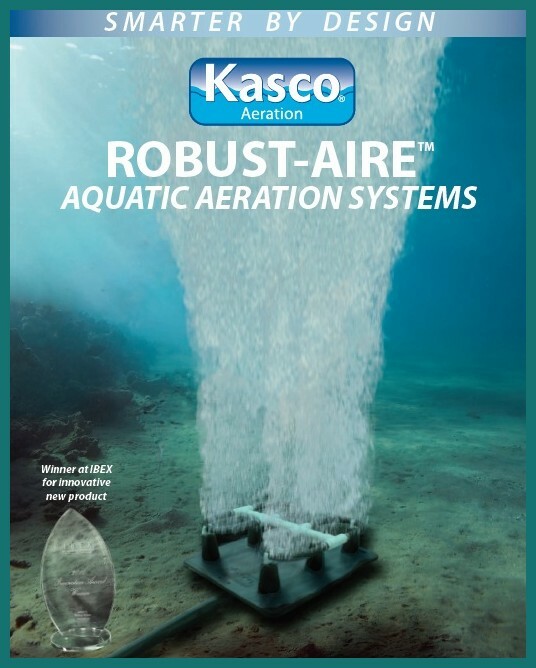 After LOTs of Reading I decided to try Robust-Aire Diffusers by KASCO. 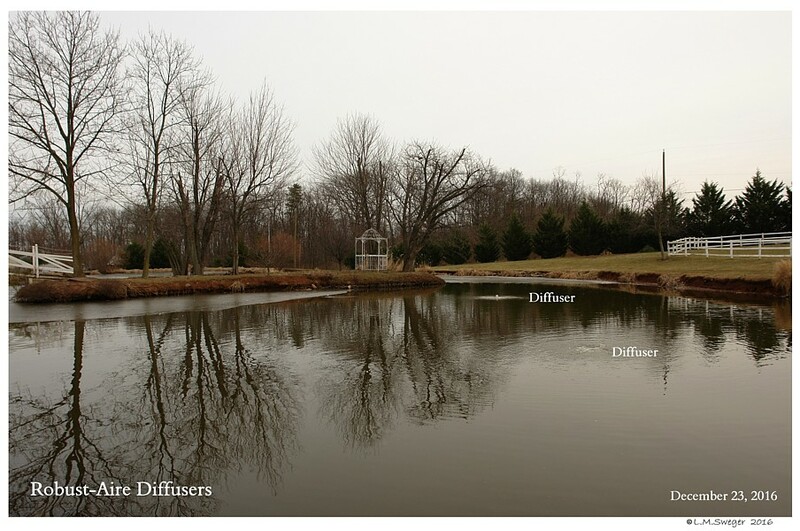 These Bubble Diffusers are Placed on the Bottom of the Pond..
Air is Pumped through weighted Hose to the Diffusers.. 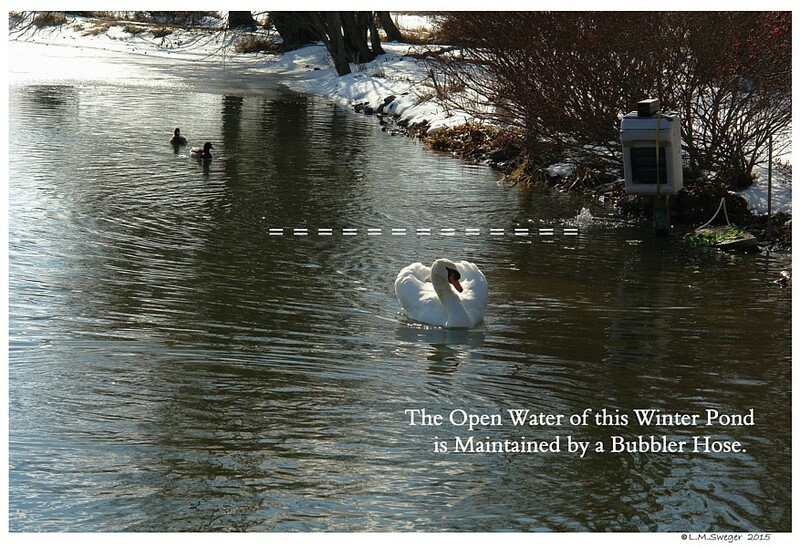 Streams of Bubbles move Water from the Bottom of the Pond where the Water is Warmer.. to the Surface. Nothing for the Swans to get hurt with, Except a Rope on the Location Bottle-Buoys connected to the Diffusers. These needs to be kept Taunt, so the Swans can not get Tangled. 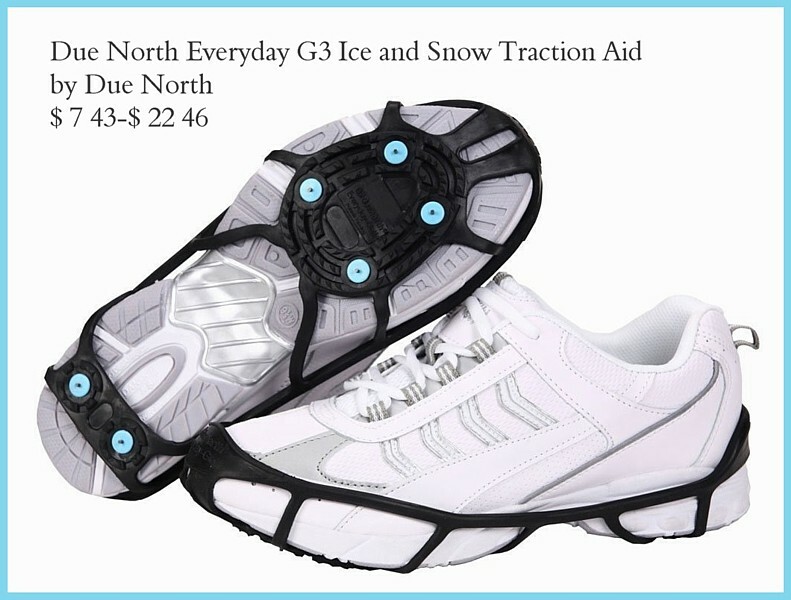 We will see how it works this coming Winter. Fingers Crossed..
Winter 2016-2017 All Worked WELL !! So Far Winter 2017-2018 Doing their Job with NO Fuss. As we Head into Winter 2018-2019 NO Operation Problems. I am NOT Crazy about the Compressor Hum..
but, NO Electric Cord in the Water is a BIG Safety Feature. The Compressor may be used at Night.. for Quiet Days. I will add a LINK to the Diffuser Page when it is Ready. 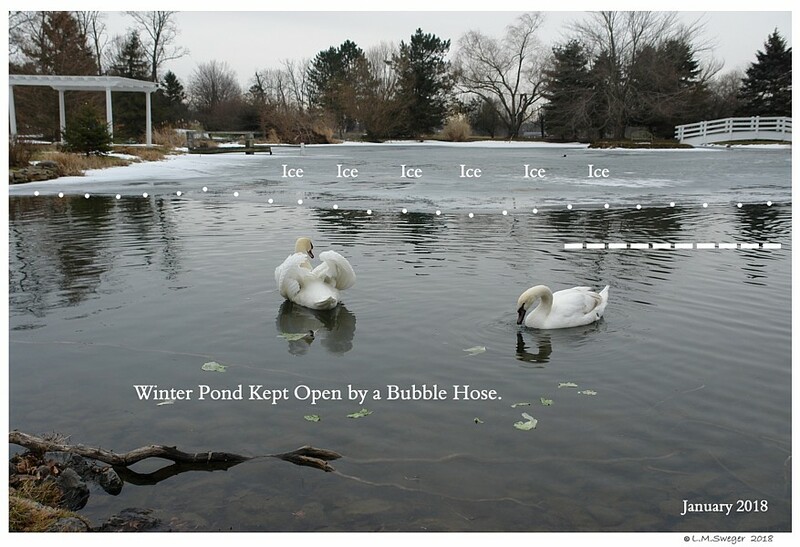 One Pond we Visit uses Bubble Hose.. and it works very well.. 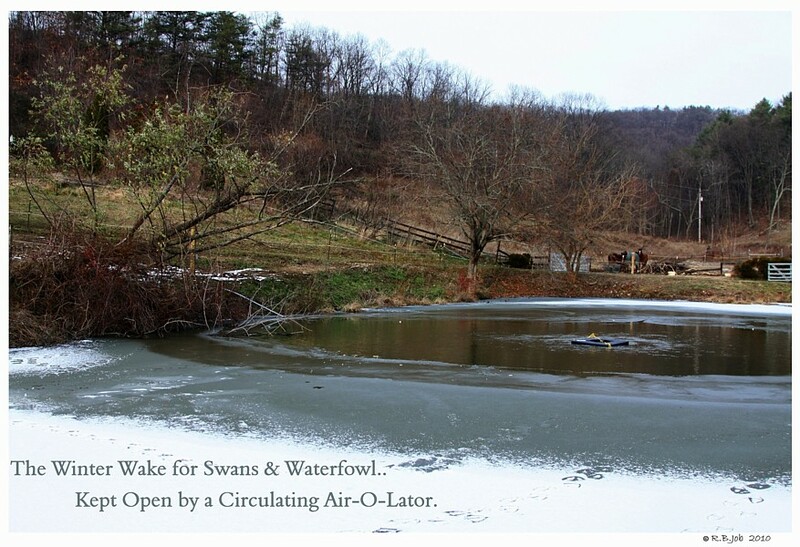 The Pond is Shallow at the End near the FarmHouse, not deep enough for the Air-O-Lator type of Aerator. The other Day listening to the Weather Forecast they were Warning !! that areas might lose Power with the Bitter Cold. A Power Outage – OH NO !! Some Rural Areas might be without Power for Long Periods of Time. 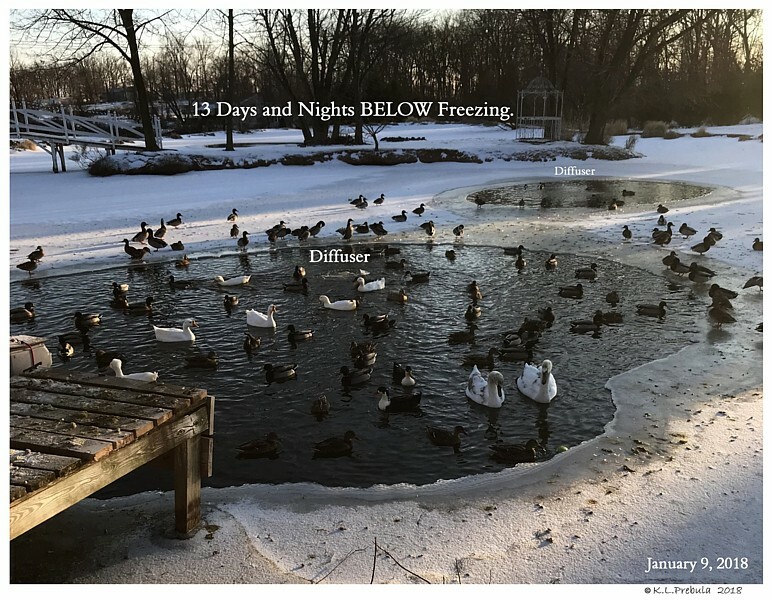 If your DeIcing Equipment Stops and Water Freezes, that would be a Time when taking Swans, Geese and Ducks into a Shelter might be Necessary. 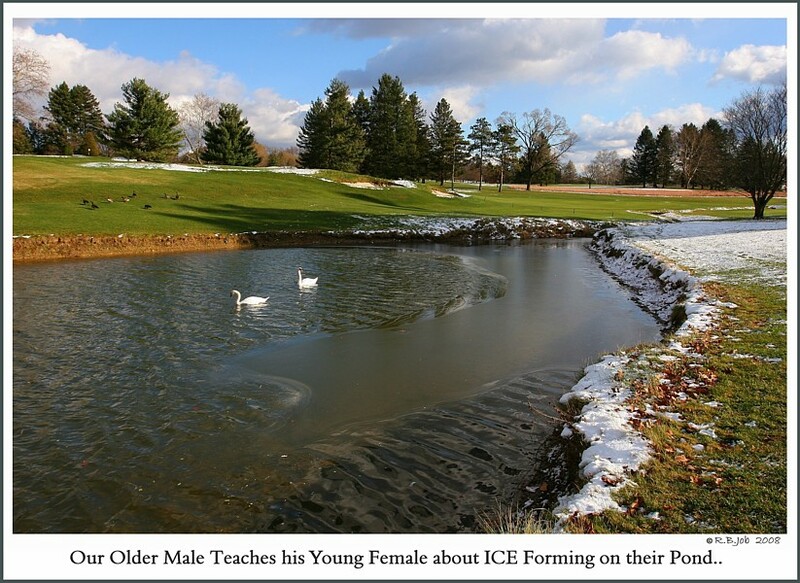 Trying to Rescue and Move Swans in Frigid Temperatures, when Ice is on their/your Water Environment.. Lake – Pond, etc. can be VERY Dangerous. DO NOT DO THIS BY YourSelf.. 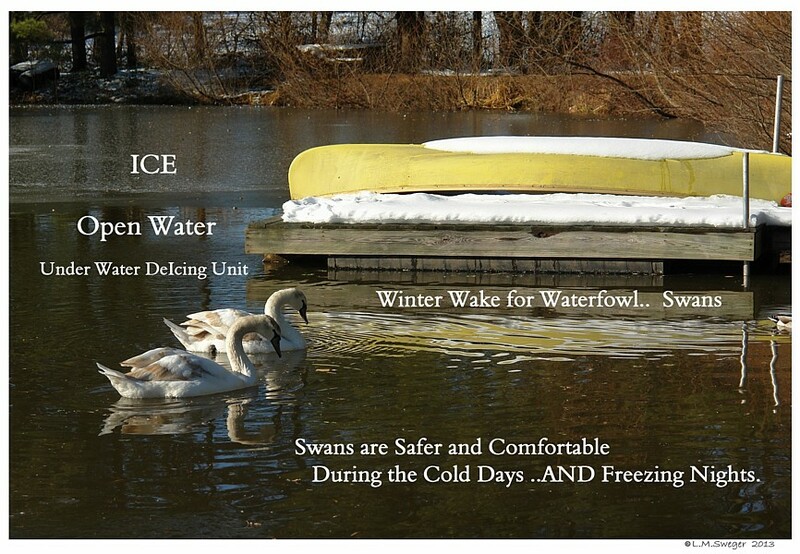 It is VERY Important to think Safety during the Winter..
You are Working and Moving around Water.. Ice..
Safety is important. 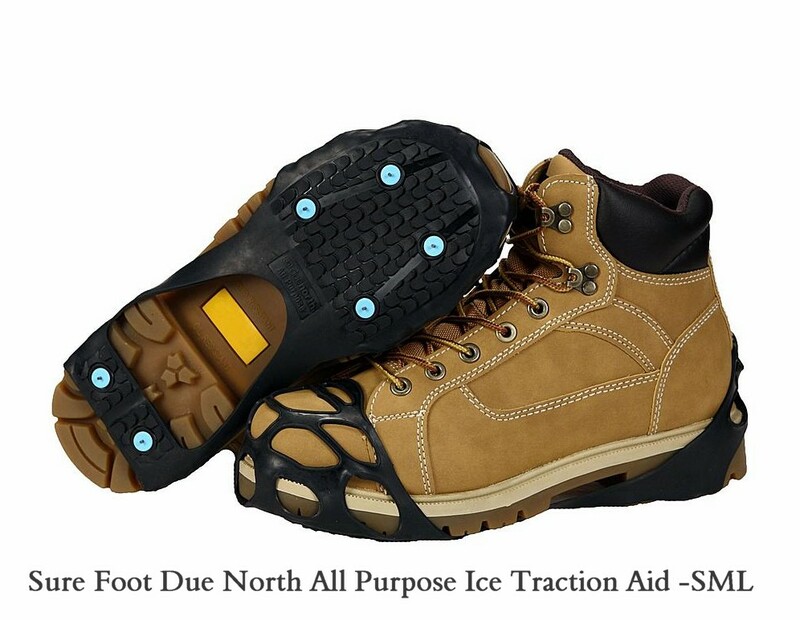 Ice Cleats might be something to think about. We have used these for Years with GREAT Results.. NO Falls. 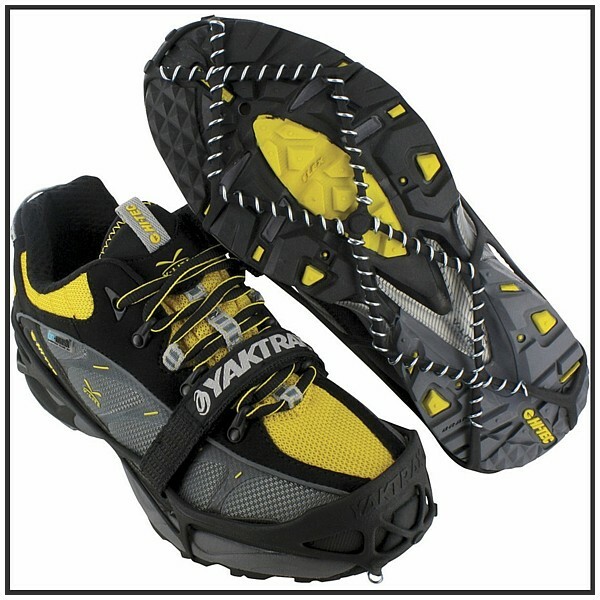 There are a Wide Variety of “Cleats” to Pull on to Boots & Shoes. 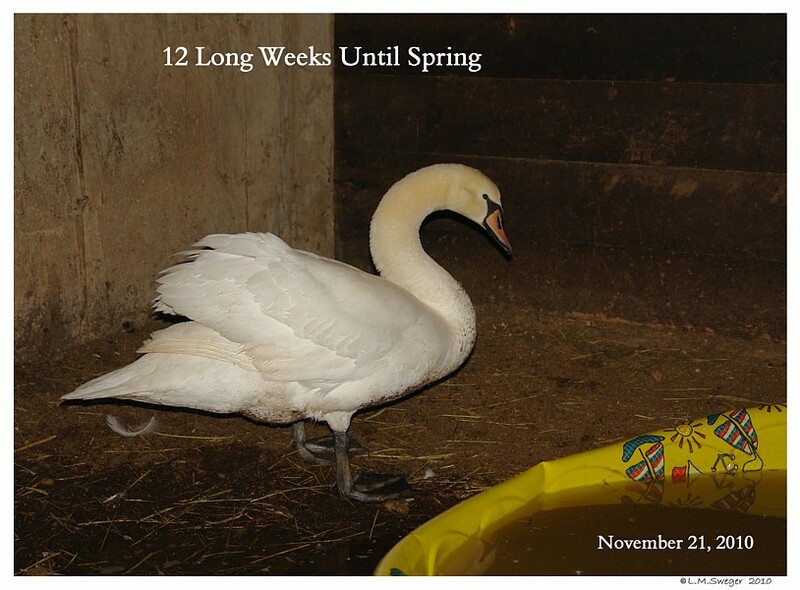 The BEST thing you can do for your Swans is prepare for Winter during the Fall Months. Have a Back-Up Plan. AND then Feed them Daily so they have the Calories for Quick Energy to keep them Warm and Healthy. 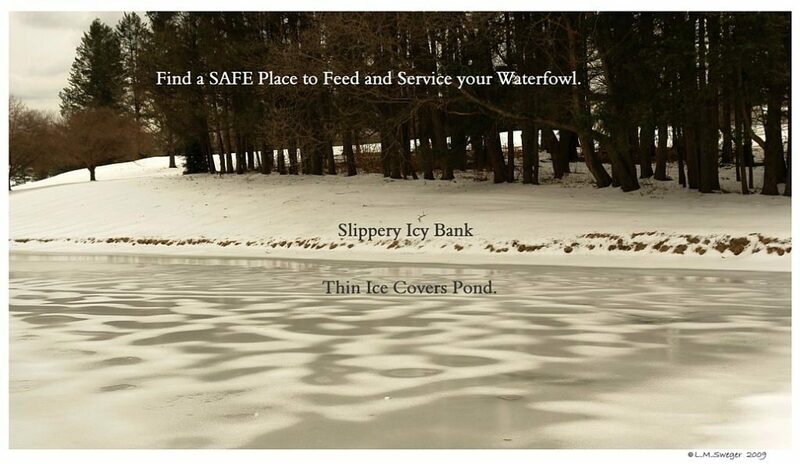 Plan ahead to Service a Feeding Station where YOU are Safe. This Information is a Work in Progress…..
As I learn more I will add to this information..